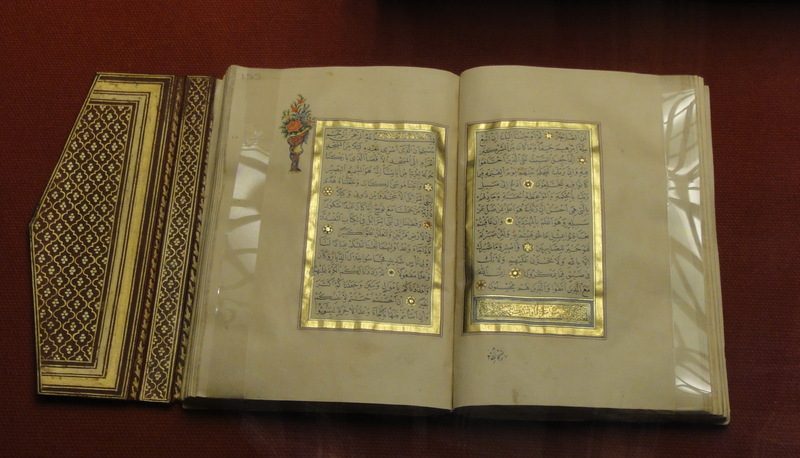 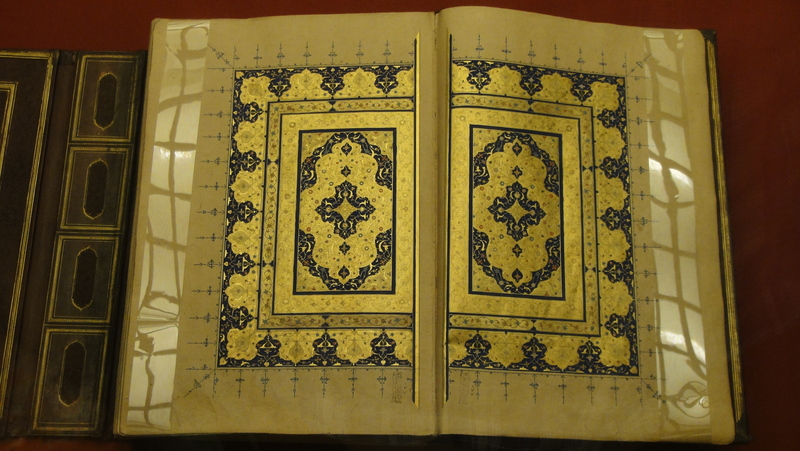 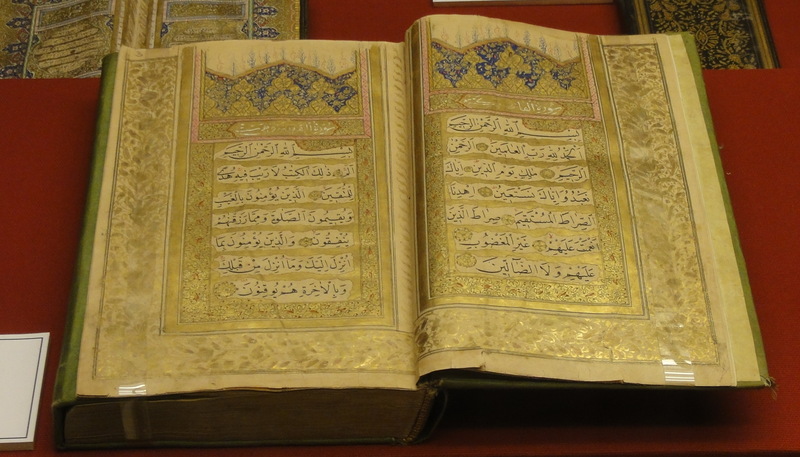 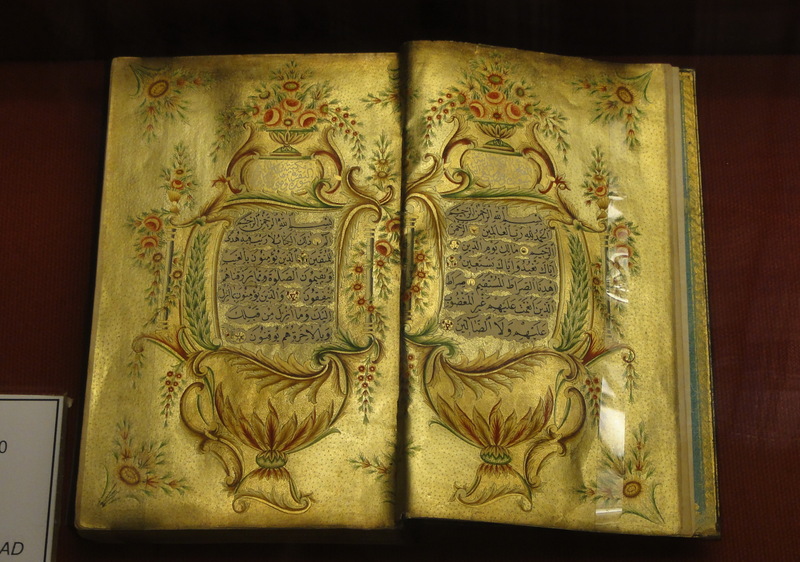 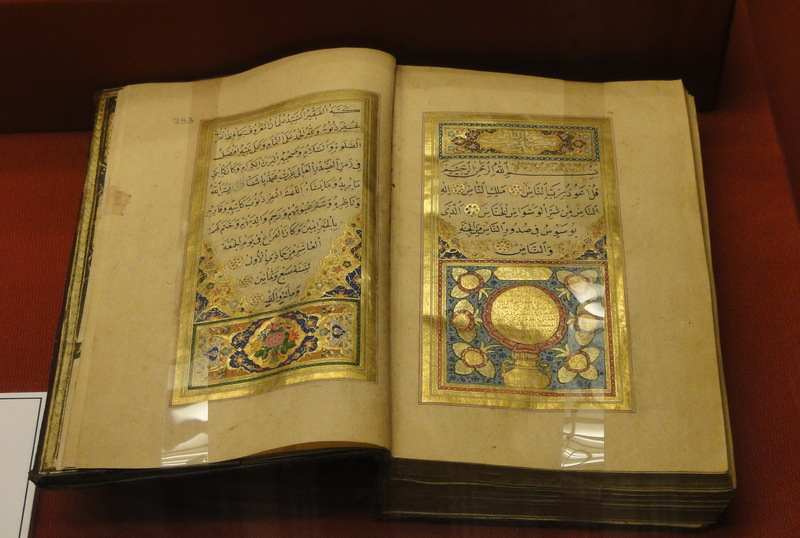 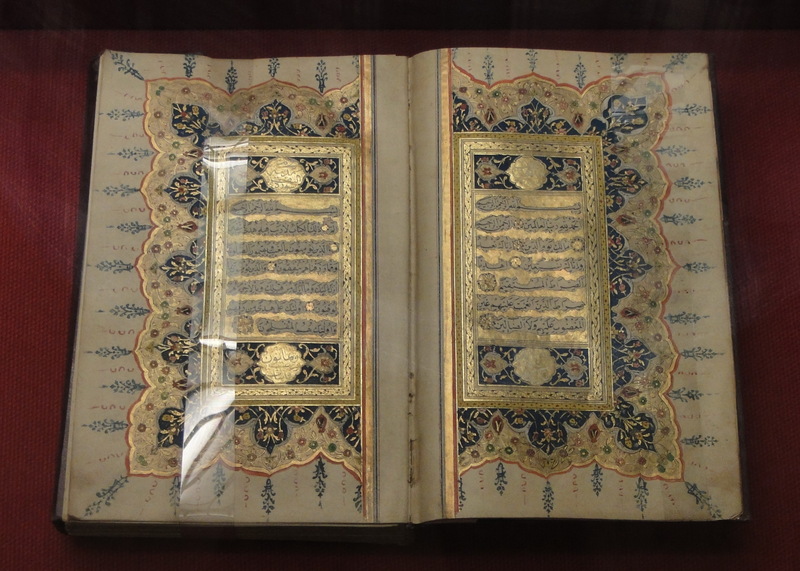 The Turkish and Islamic Arts Museum in Istanbul has a rich and very well displayed collection of Islamic illustrated manuscripts ranging from 8th century Baghdadi to 18th century Ottoman. 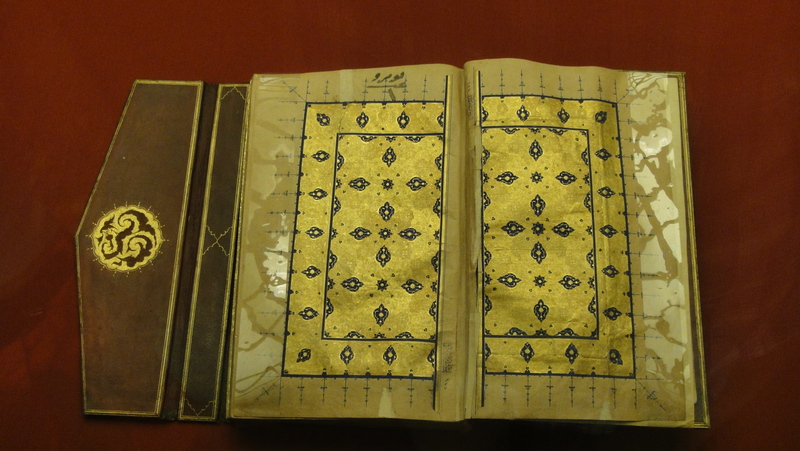 I have placed the whole photo collection online here, but post herewith just a few tidbits to whet your appetite. 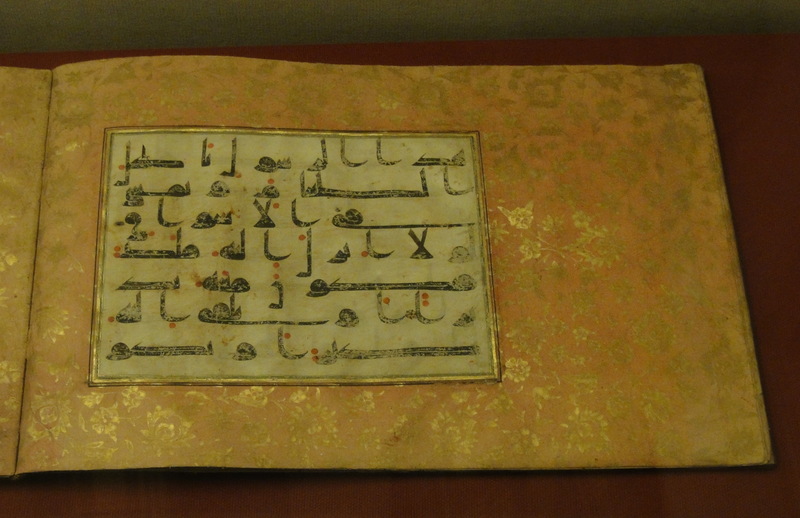 The above is an 18th century Ottoman manuscript, in principle a ladies delight, but perfectly capable of pleasing a more-is-more kinda guy like yours truly. 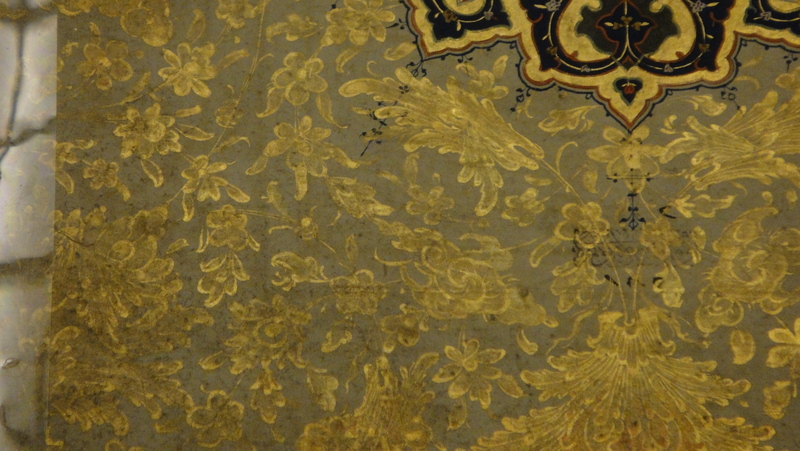 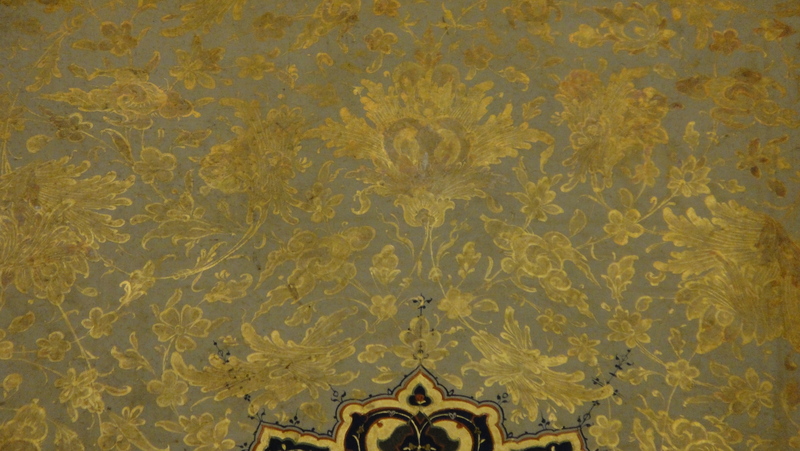 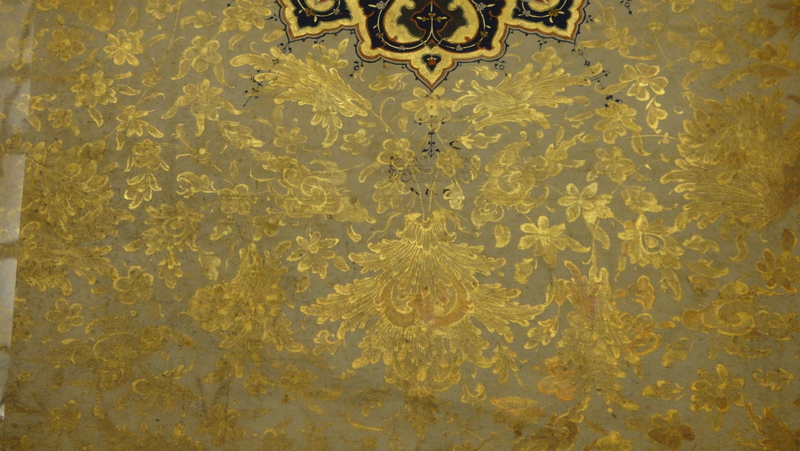 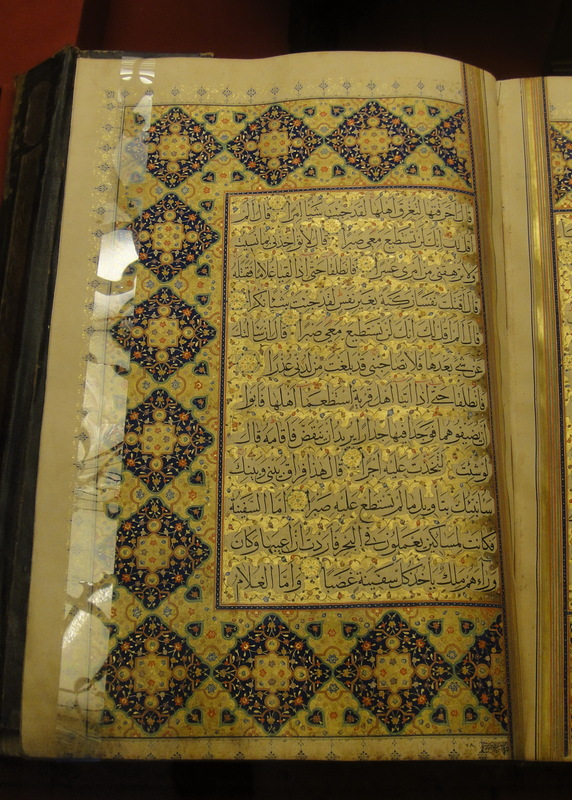 The below is a close-up of a section of a page of a large format 16th century Shirazi (Iranian) Quran: note the loving detail of what is essentially barely visible “background”. 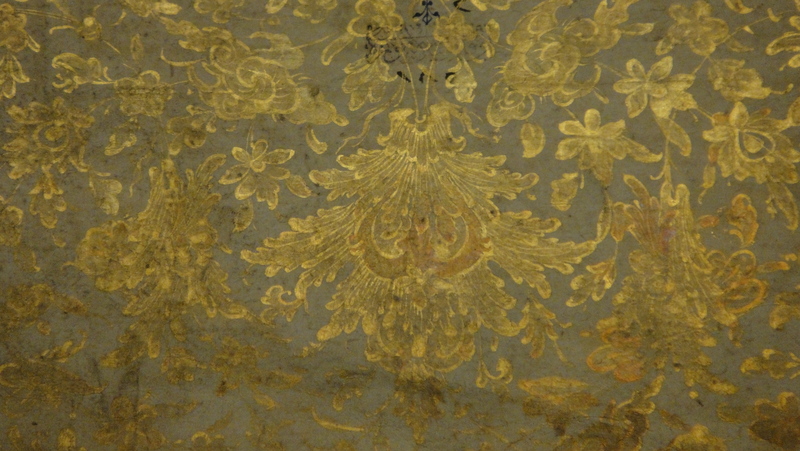 Gold “ink” was added in a number of washes with different colors and transparency. 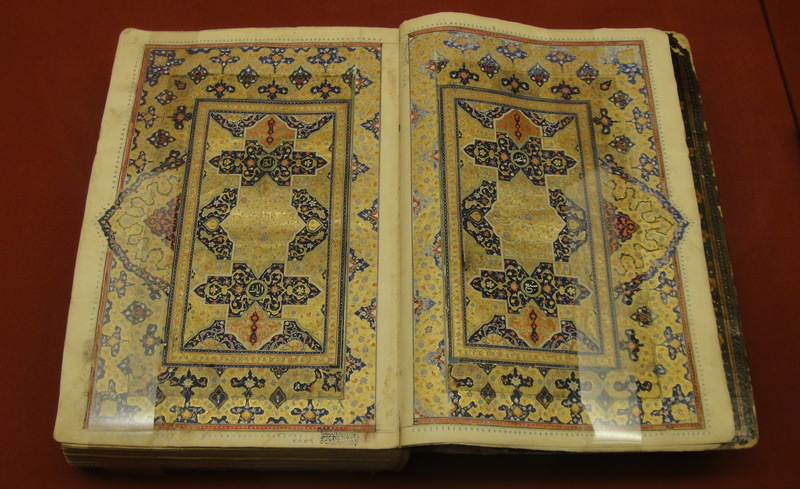 The next page is also from a 16th century Shirazi work. 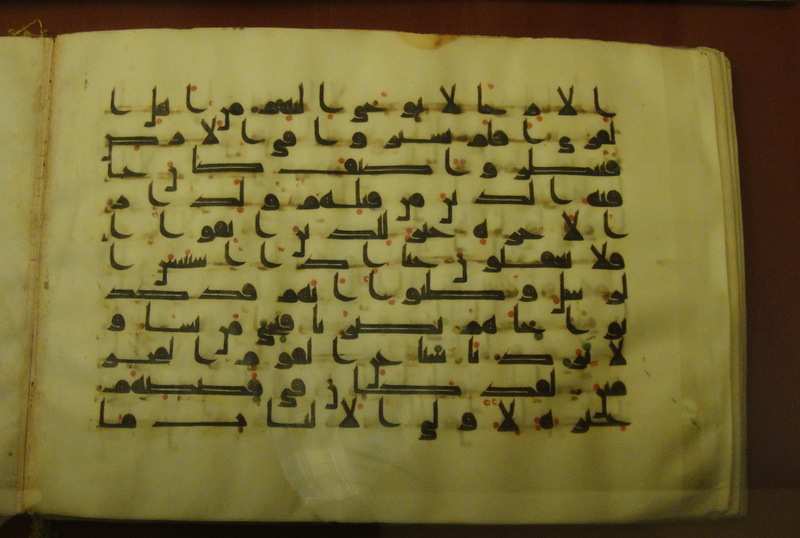 Although the Latin alphabet is more suitable for recording the vowel-rich sounds of the Turkish language, it is difficult not to feel that by abandoning the Arabic script, Turks have deprived themselves of a great deal of pleasure. 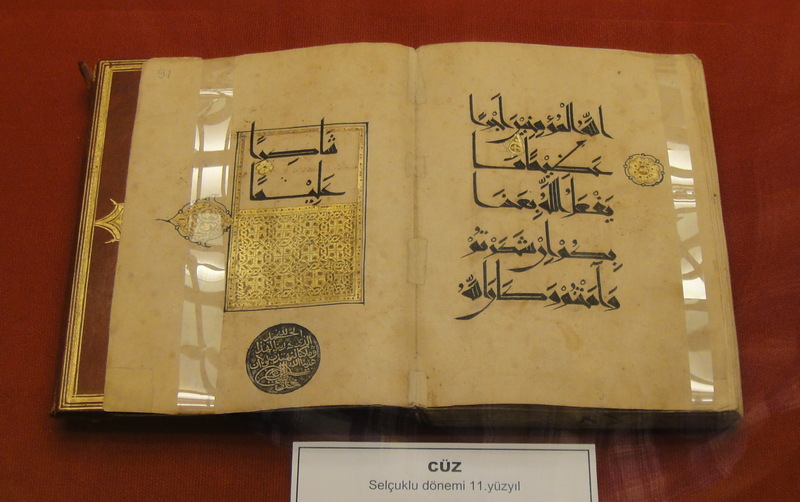 I like the size of the letters, too: senior-citizen friendly. 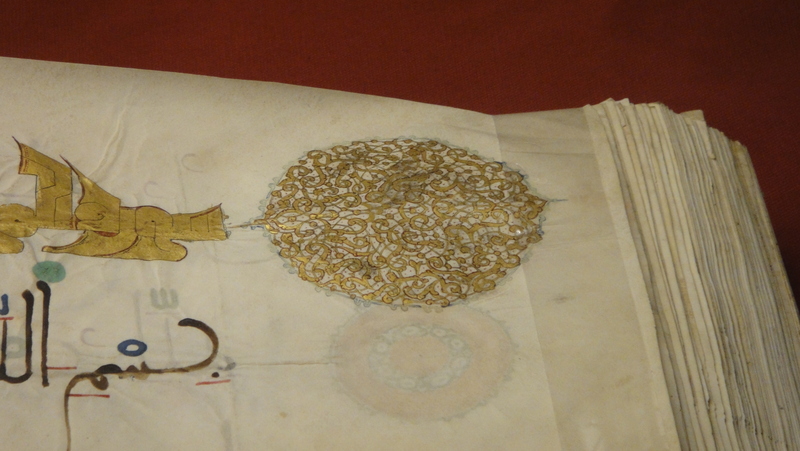 (Ahem). 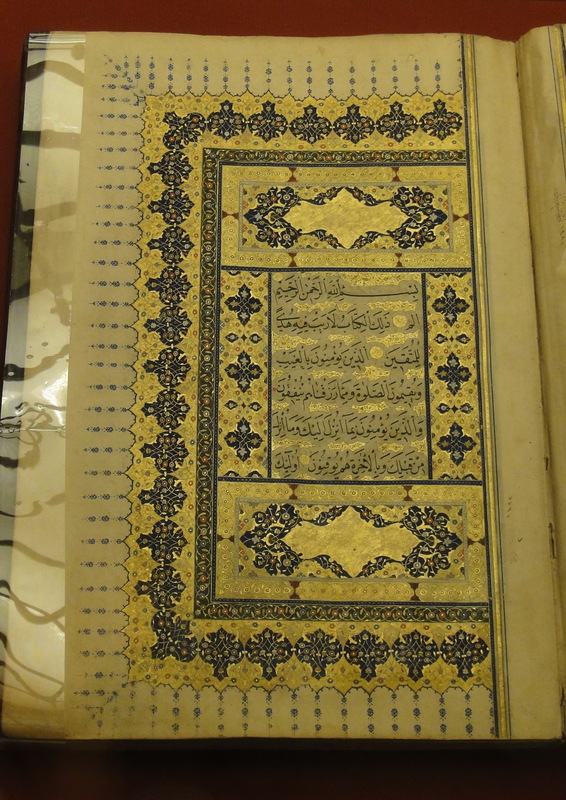 Five lines of text on a page approximately 18 inches high. 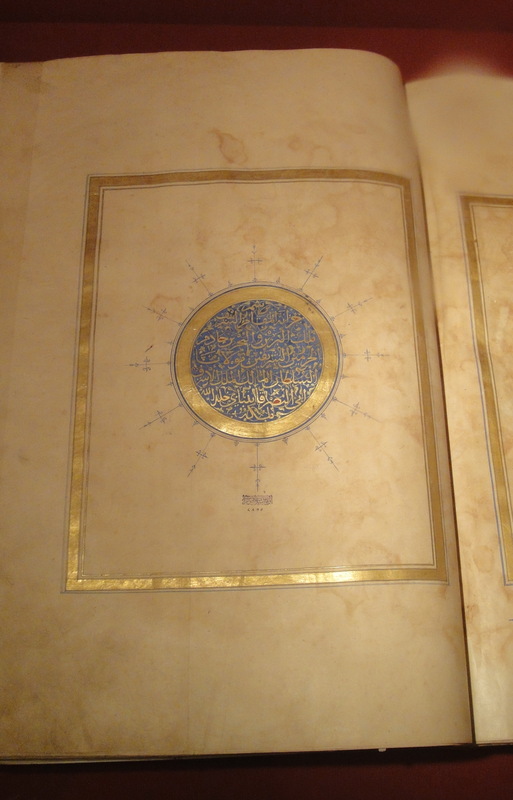 The roundels mark ends of verses. 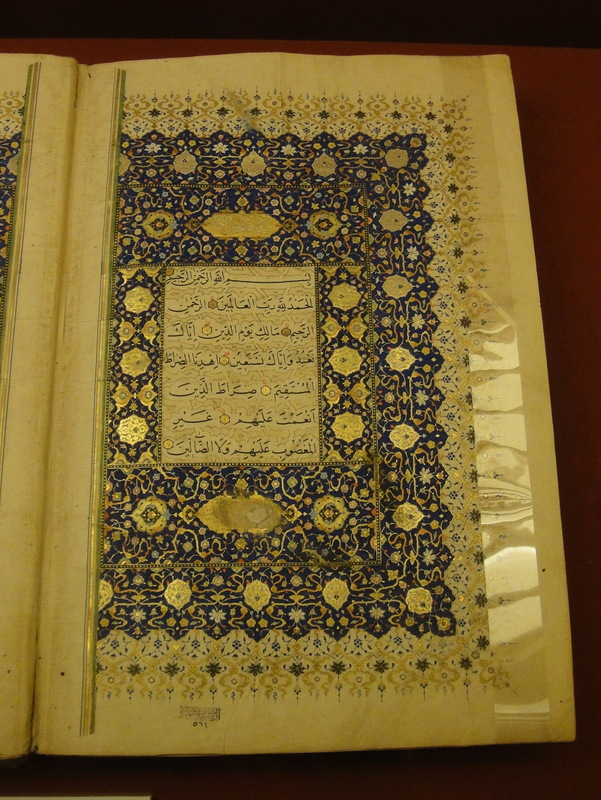 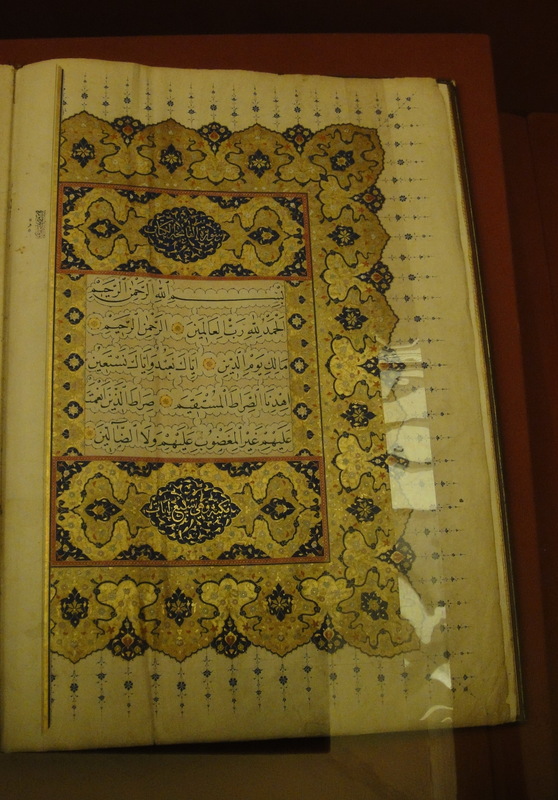 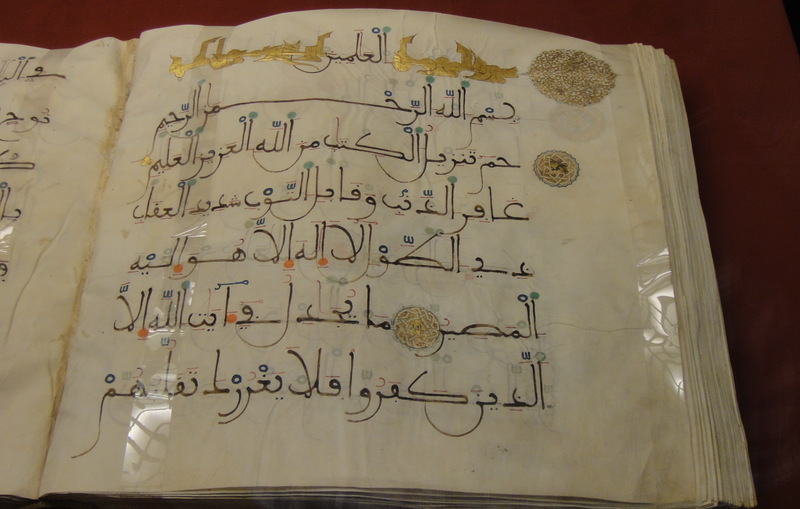 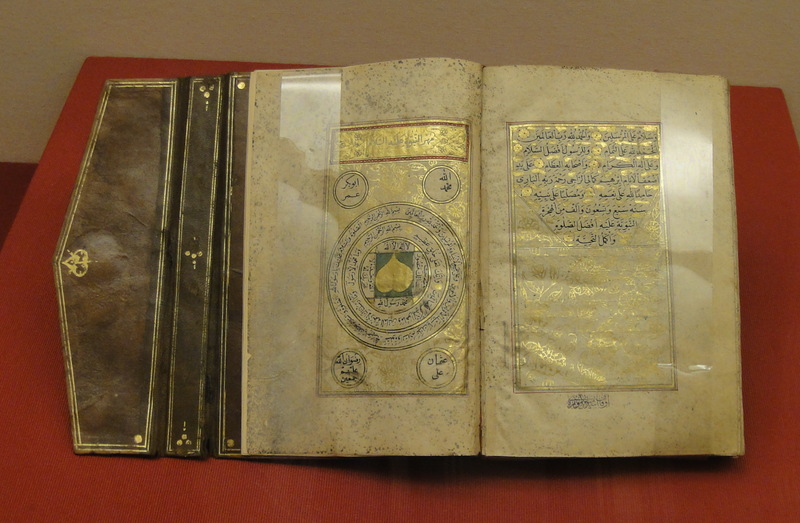 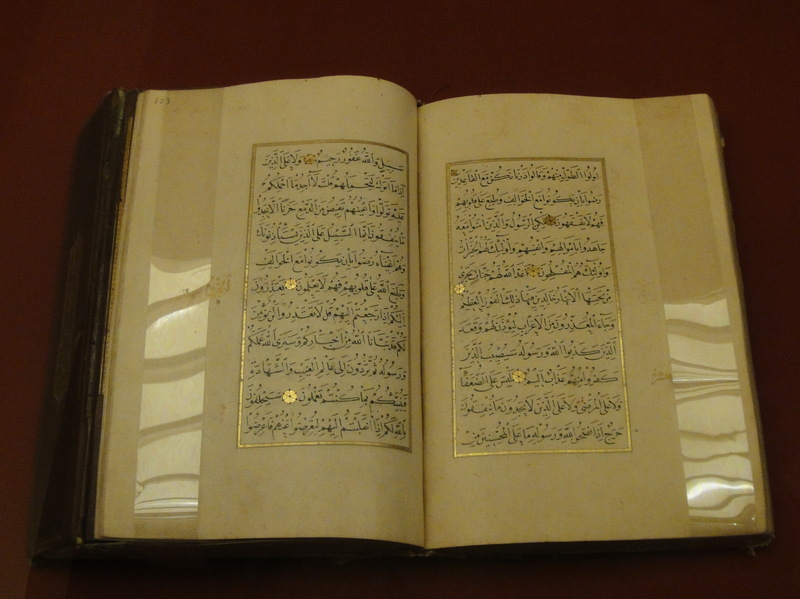 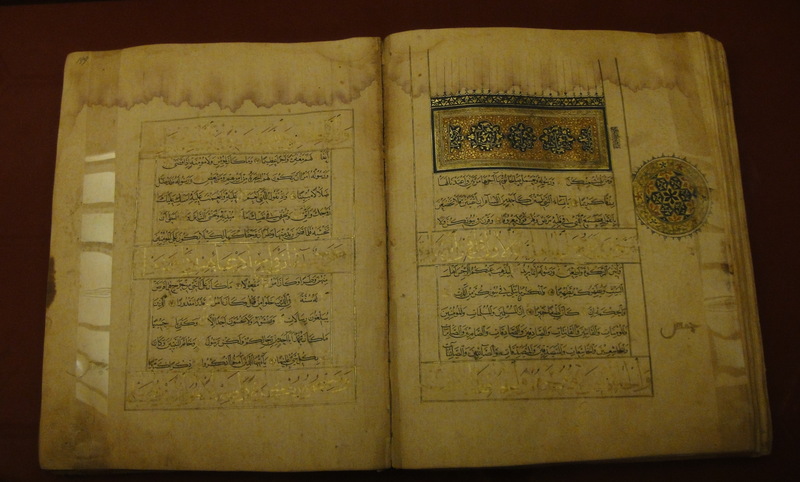 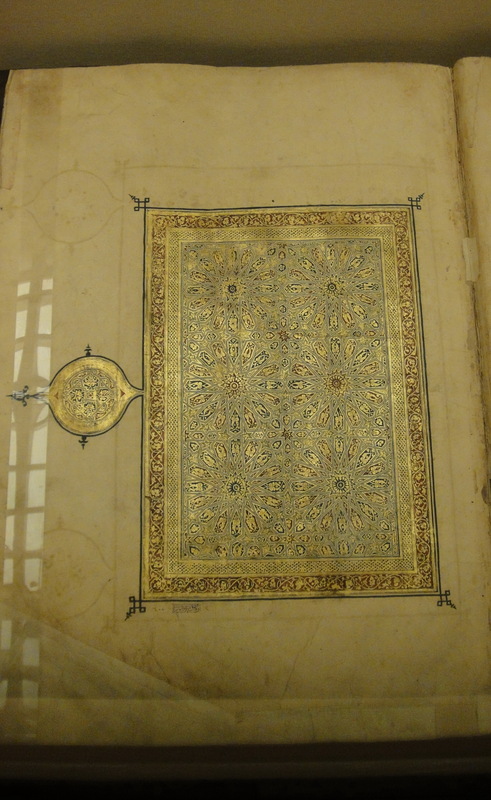 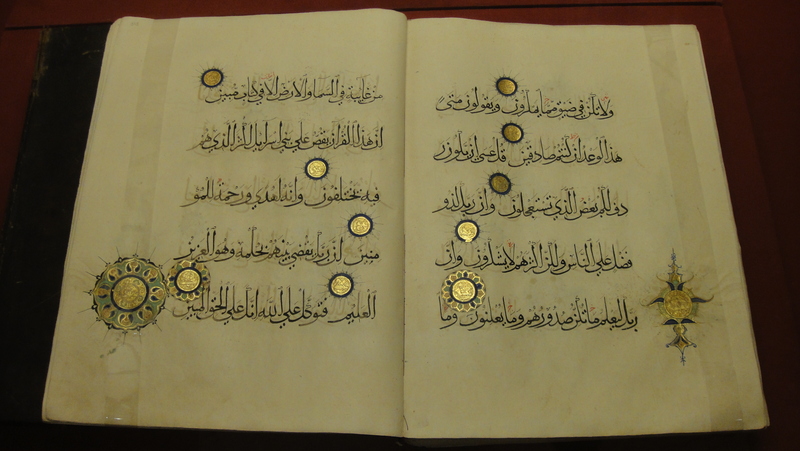 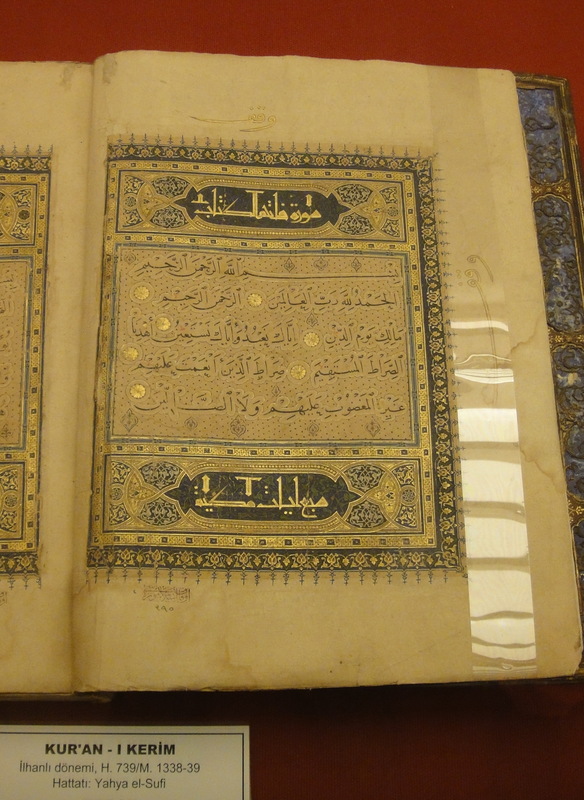 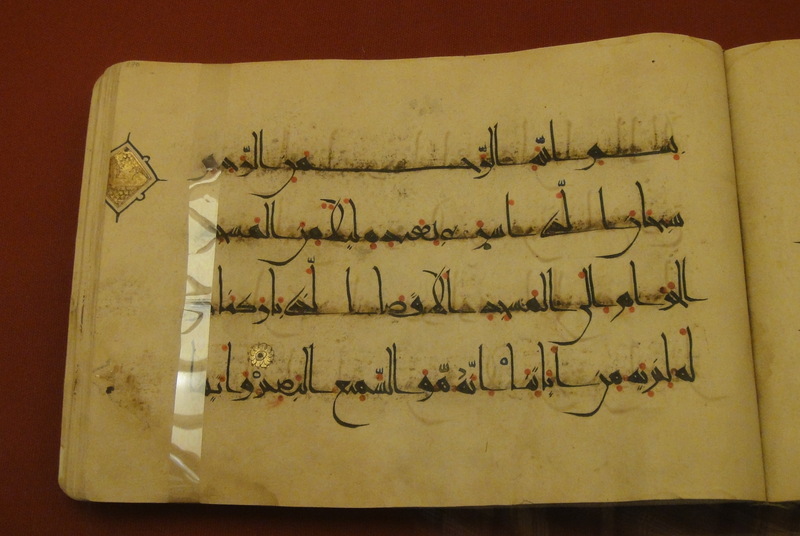 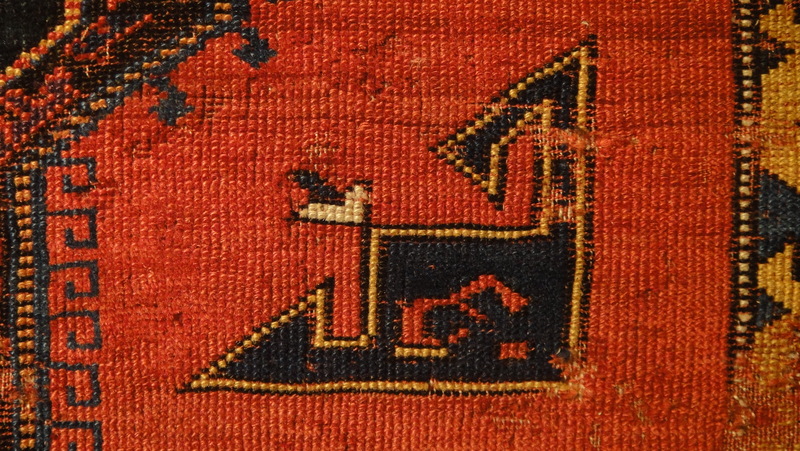 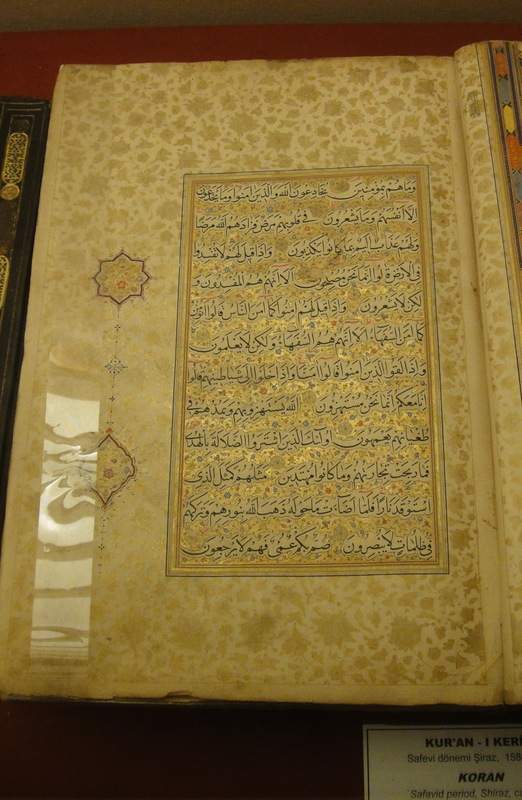 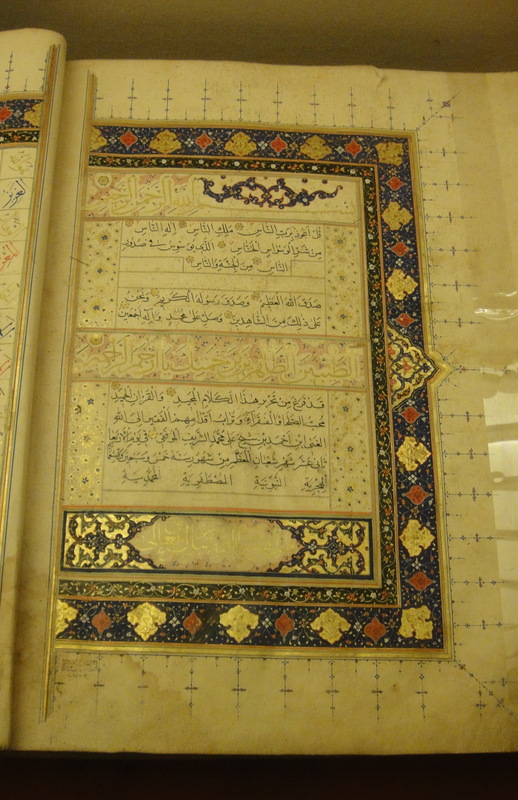 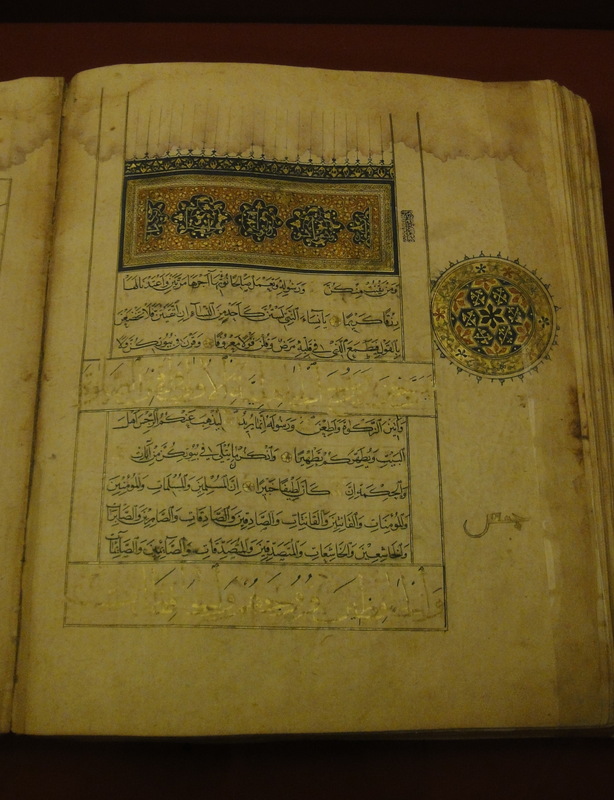 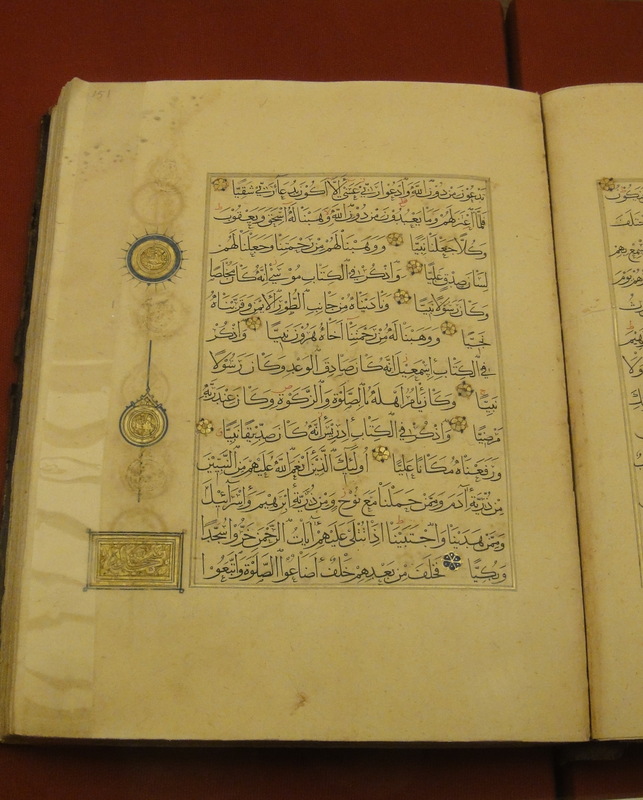 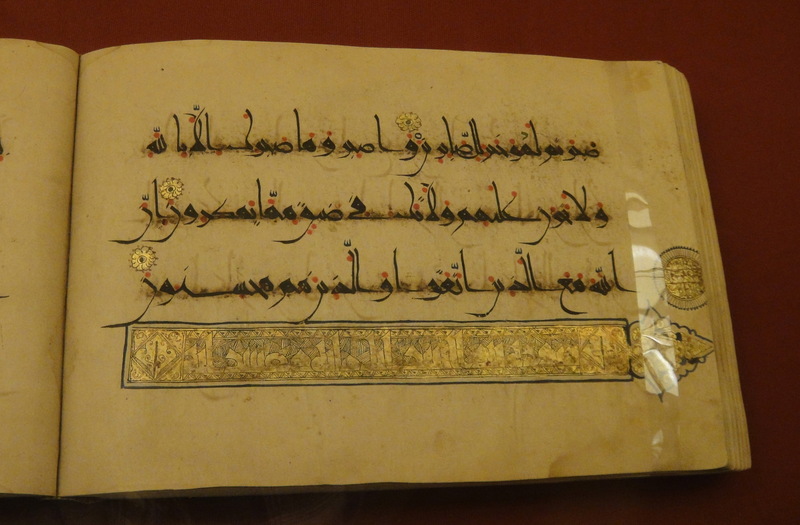 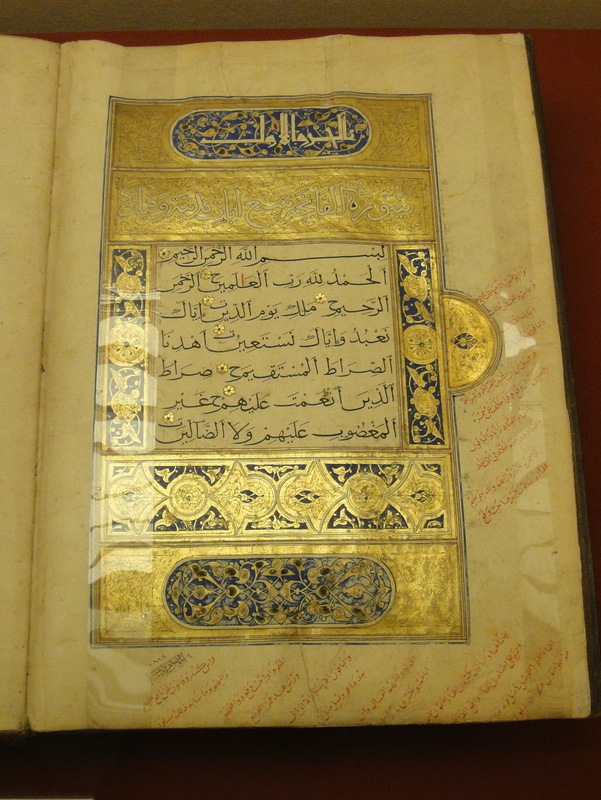 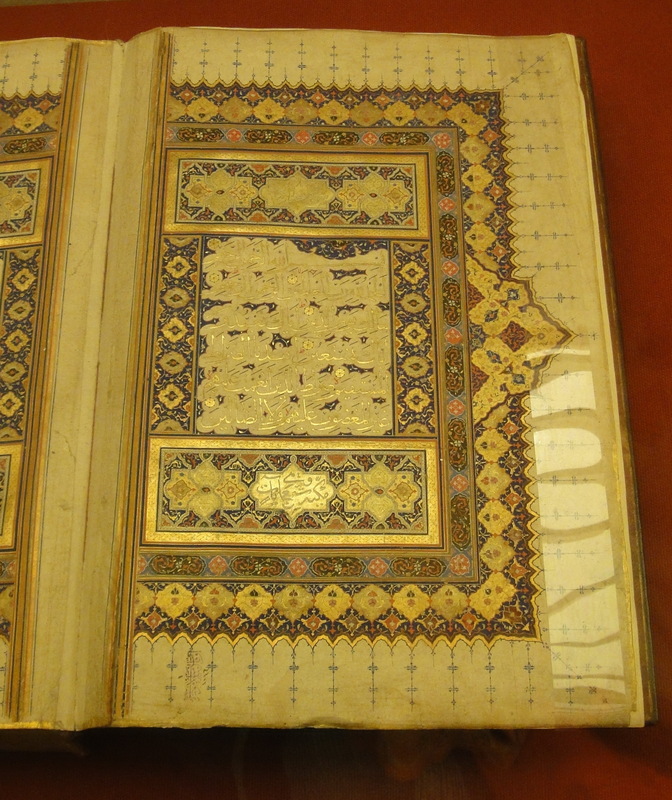 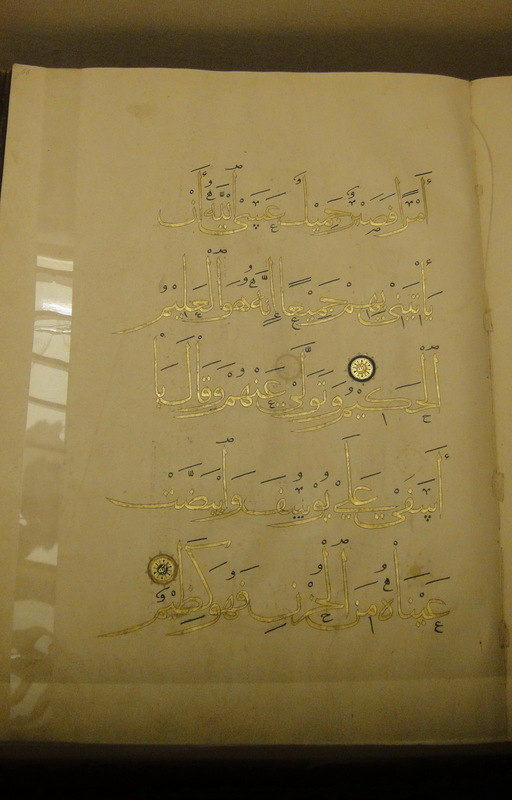 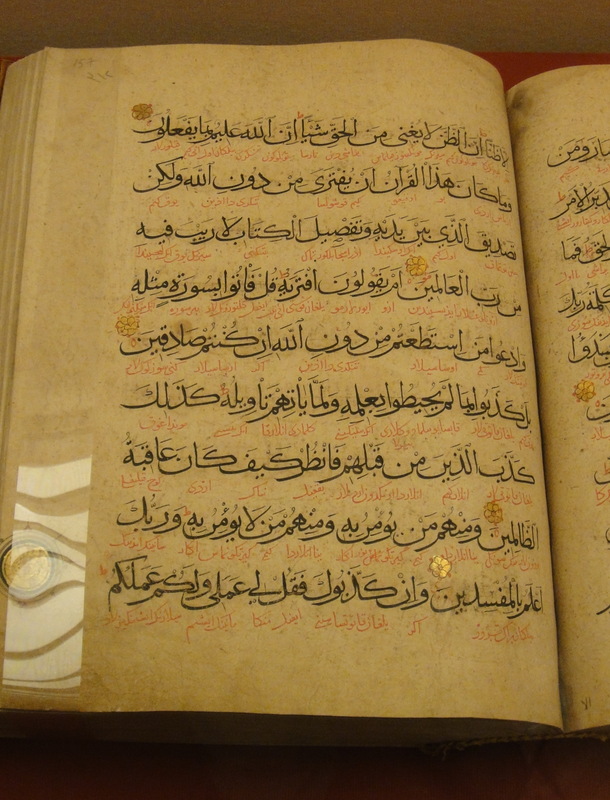 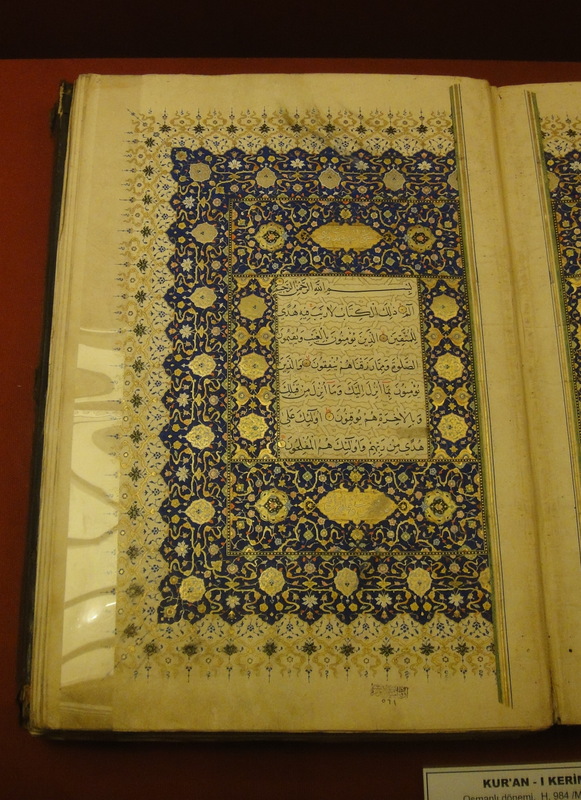 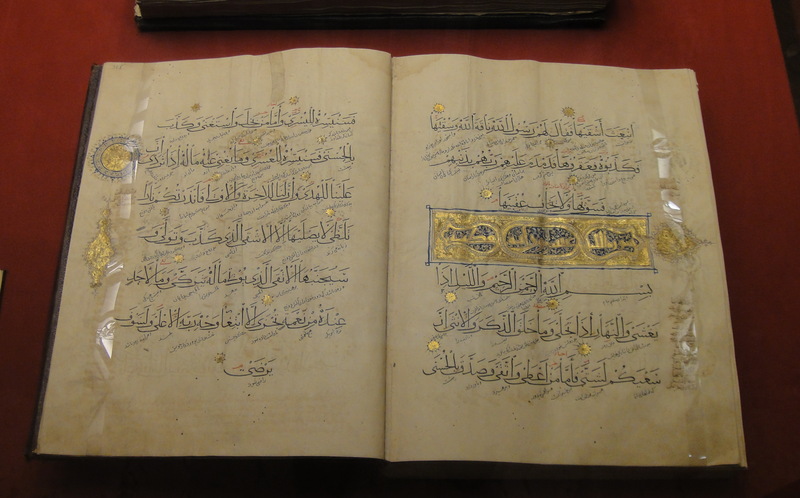 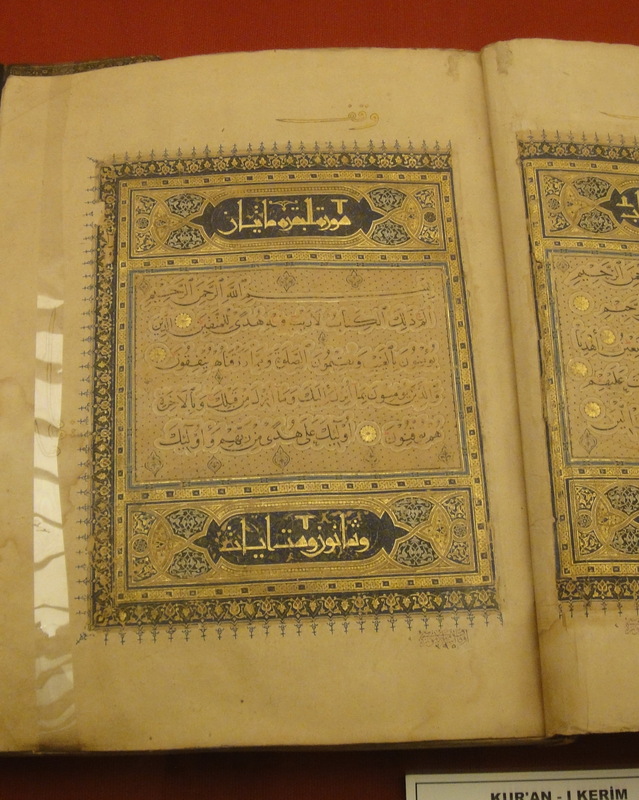 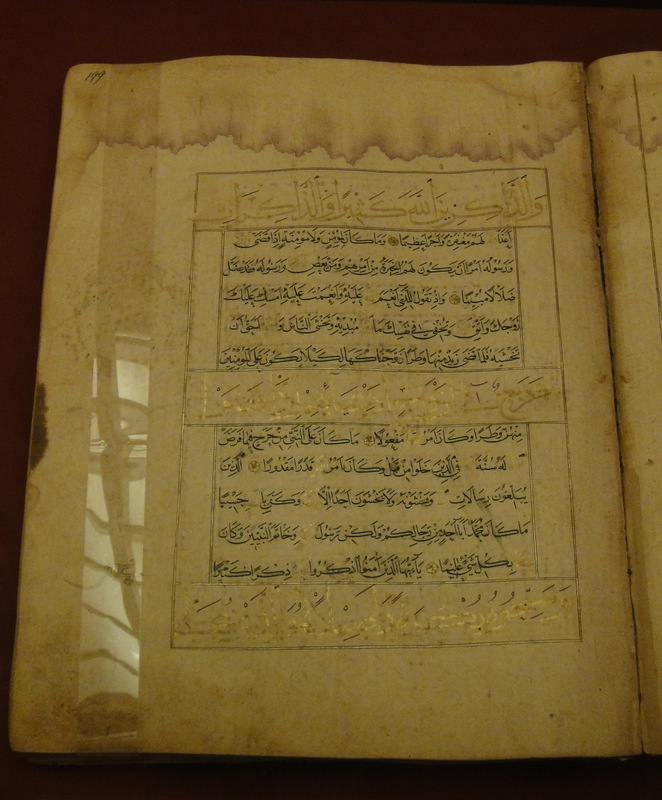 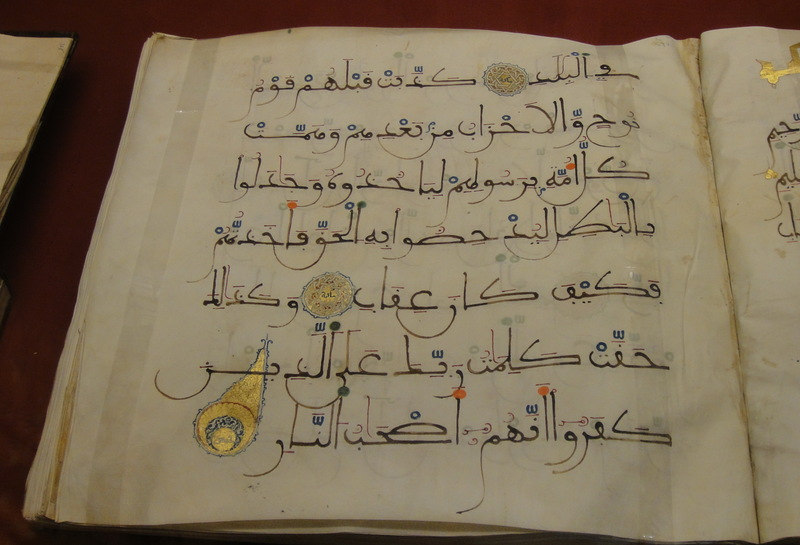 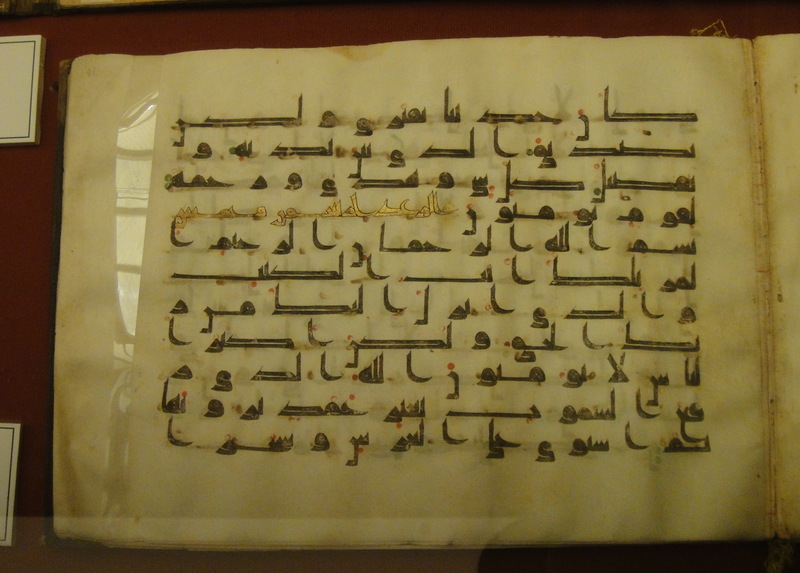 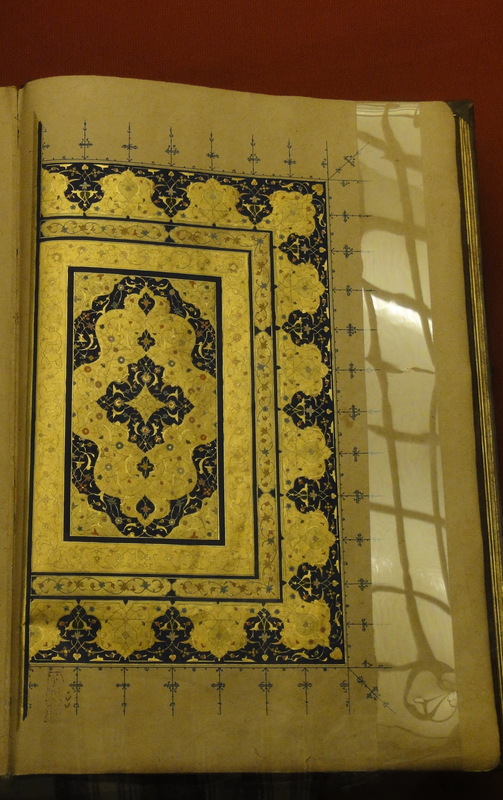 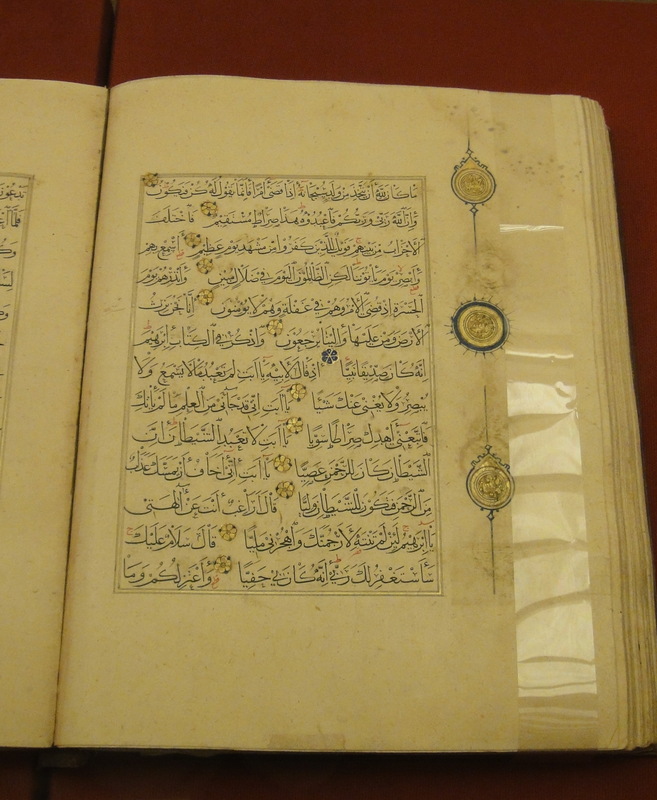 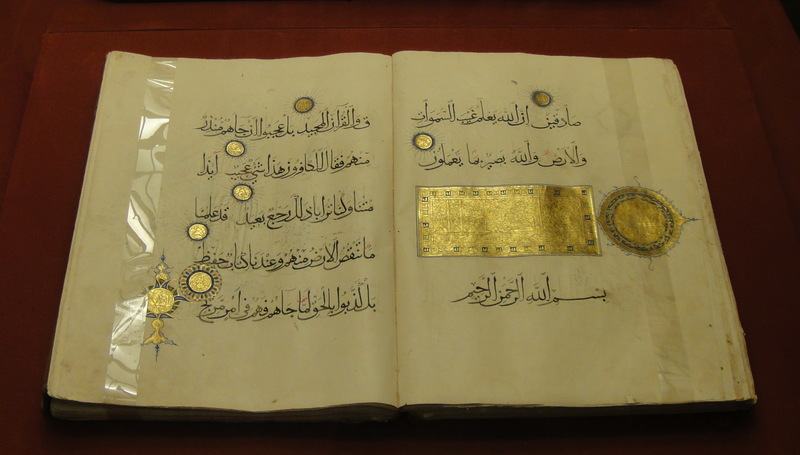 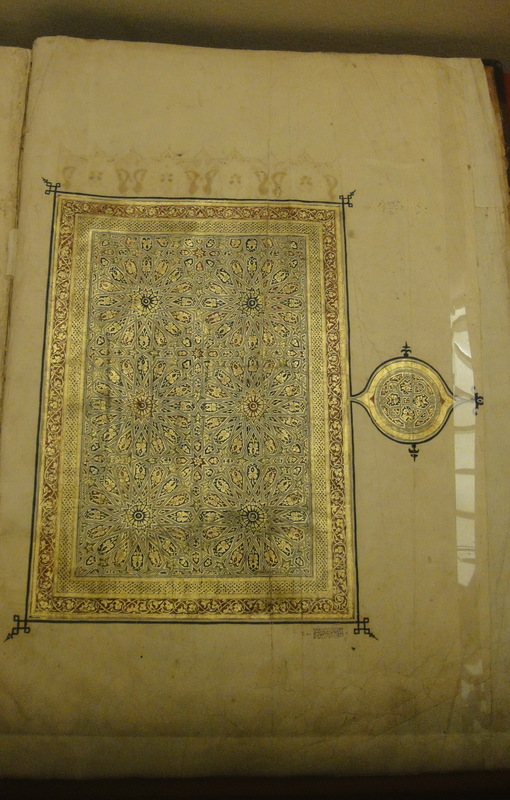 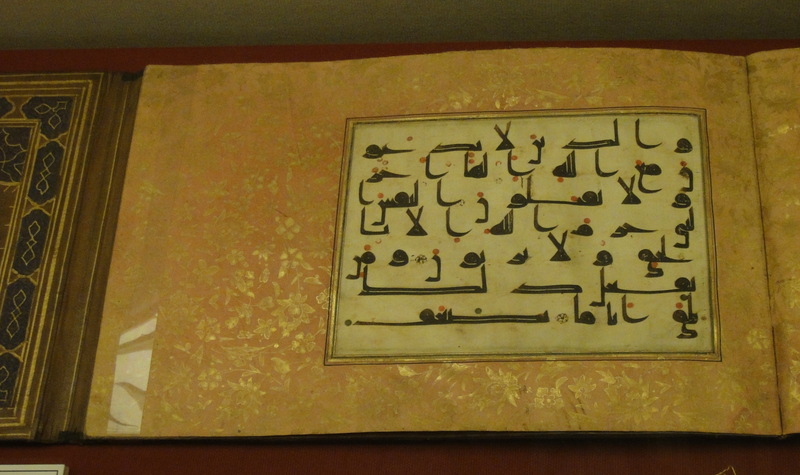 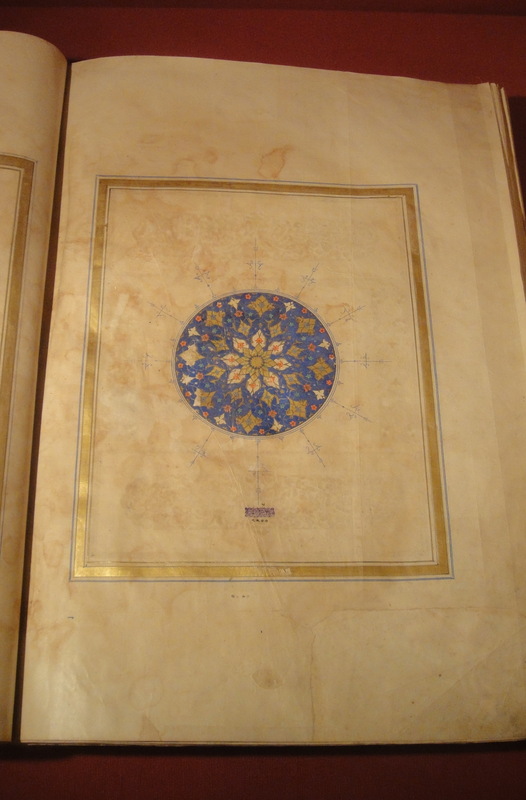 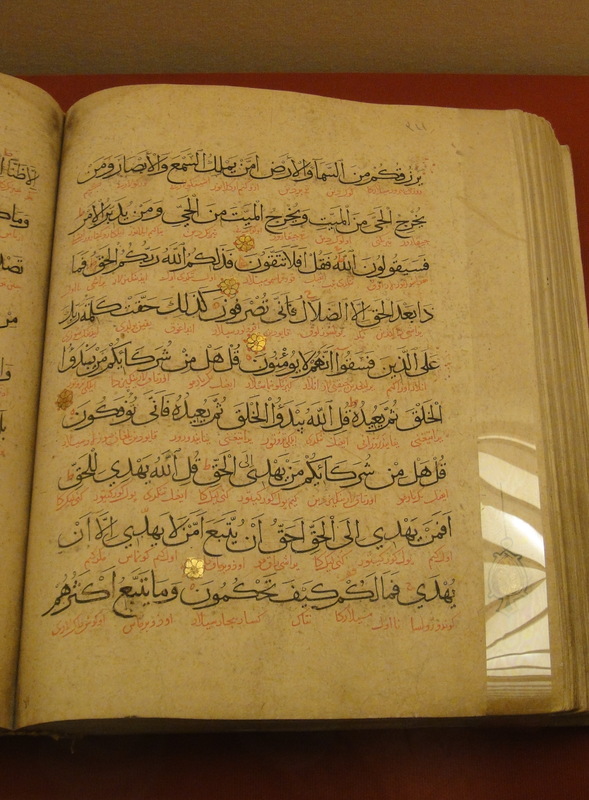 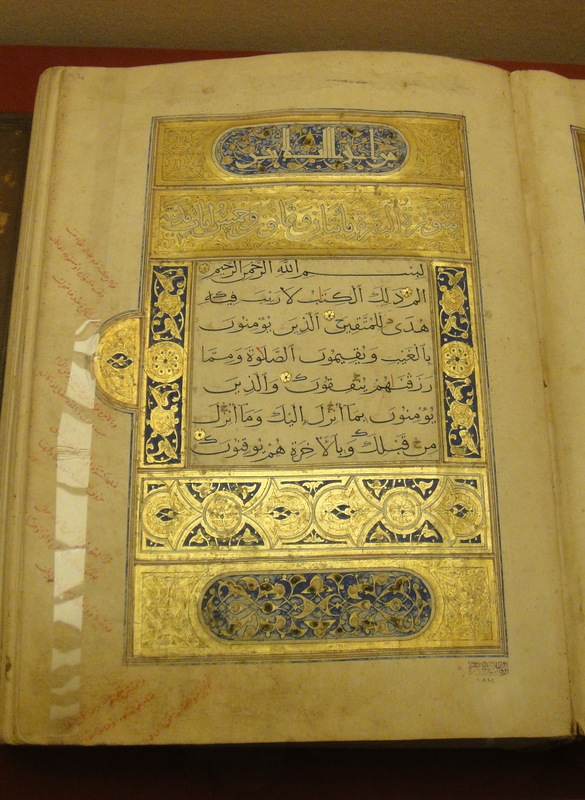 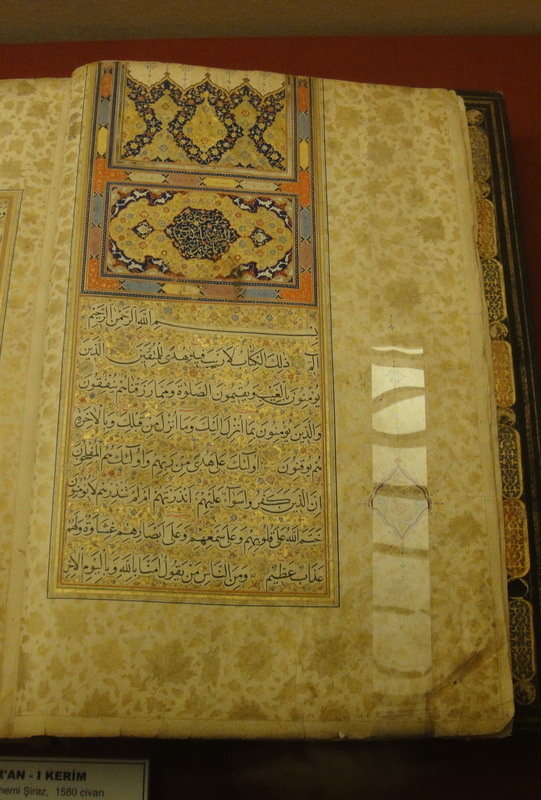 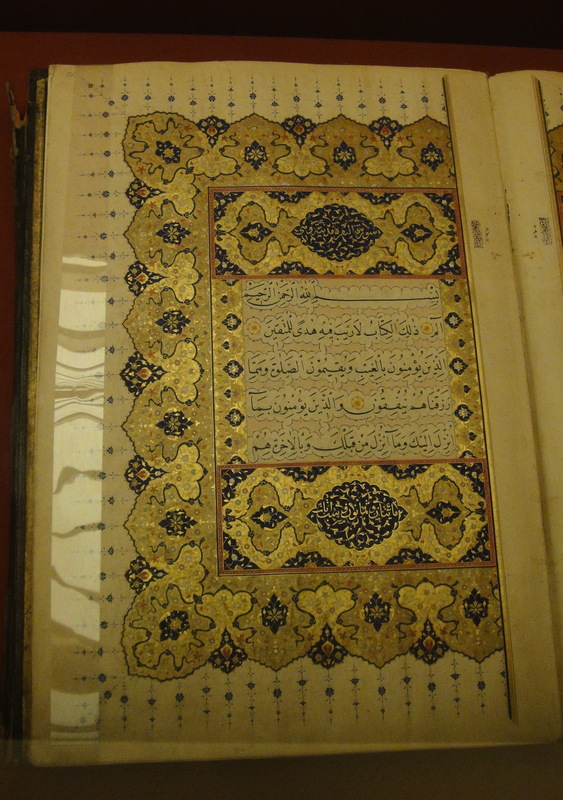 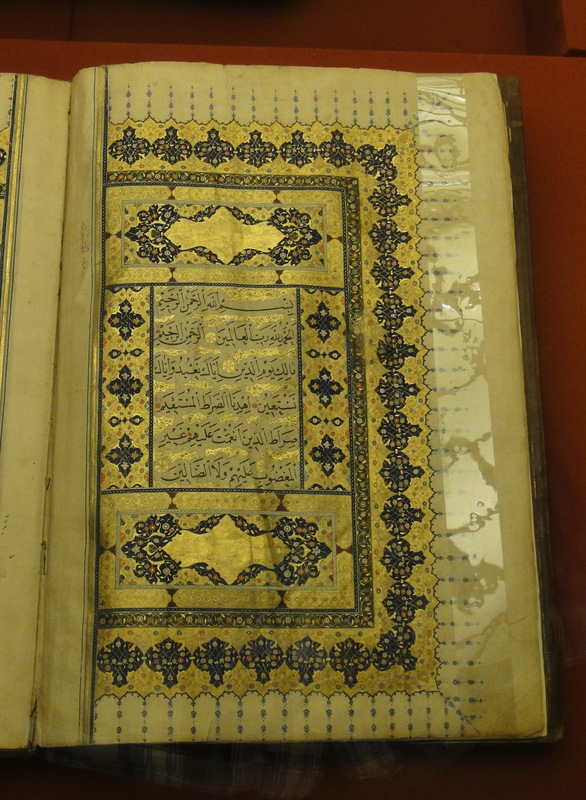 But this 13th century North African Quran is my favorite of the whole collection. 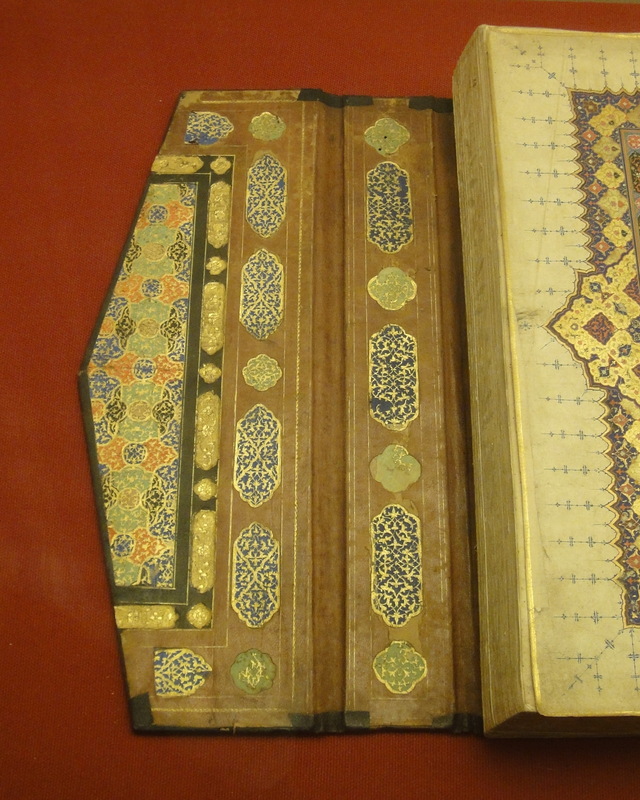 How I wish all my books were as delightful to look at! 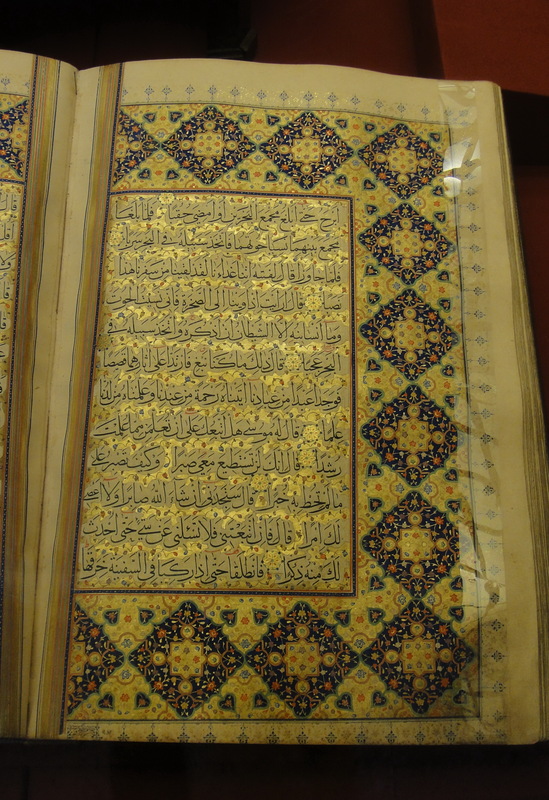 Finally, there is this: two parallel texts, each in a different color. 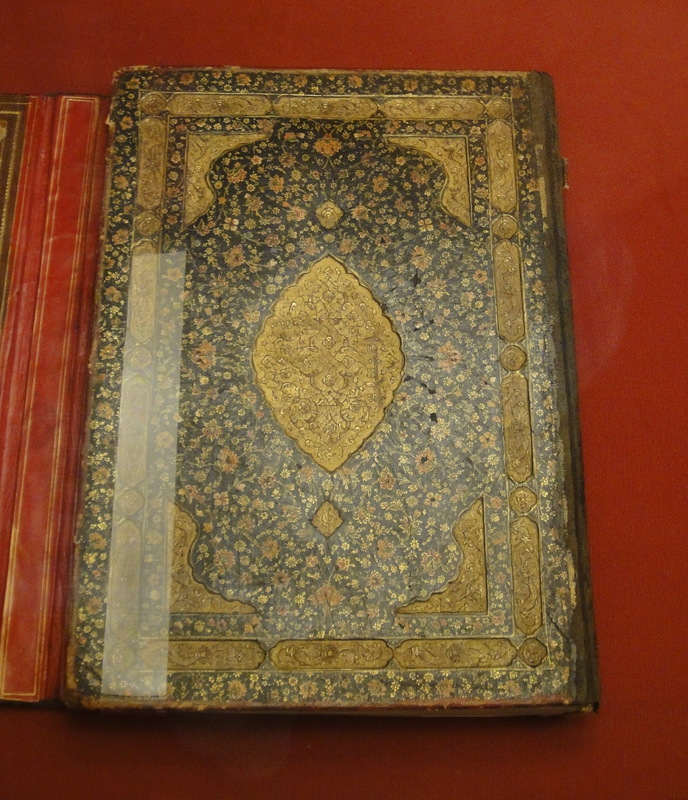 Makes sense: why read one text, when you can read two simultaneously? 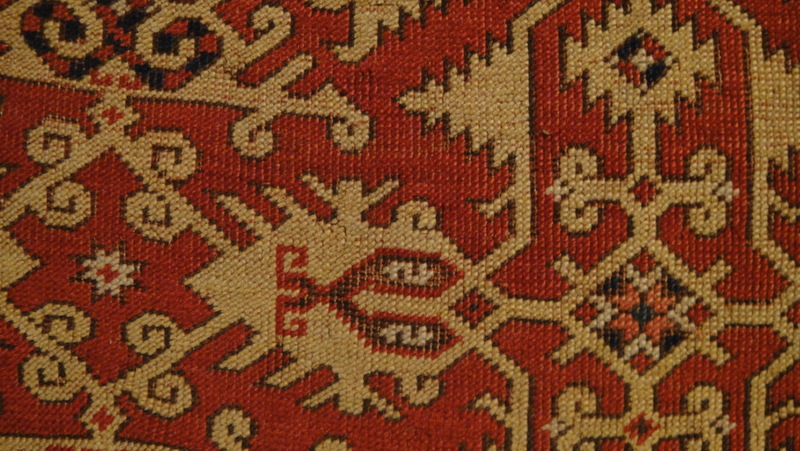 For example, you could have Joseph And His Brothers, in black, on top, and As Maias in red on the bottom. 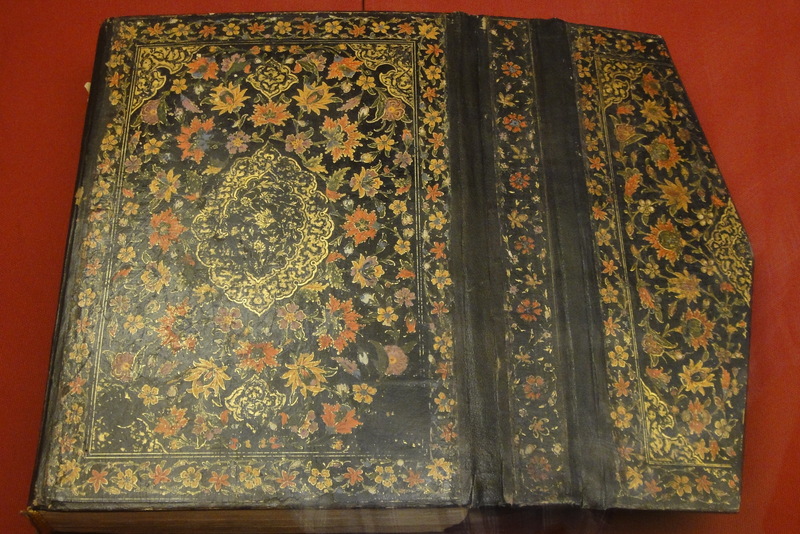 Or perhaps you could have Joseph And His Brothers in black on top and a running commentary in red below: “Wow! 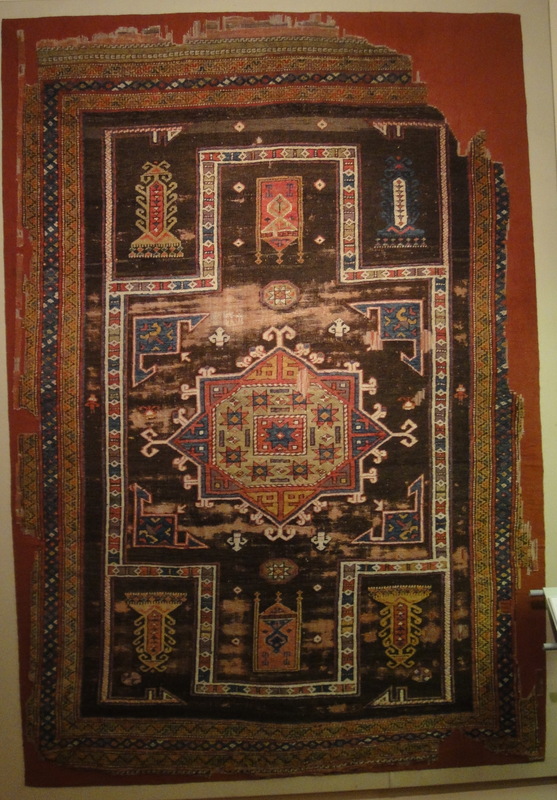 This is crazy! 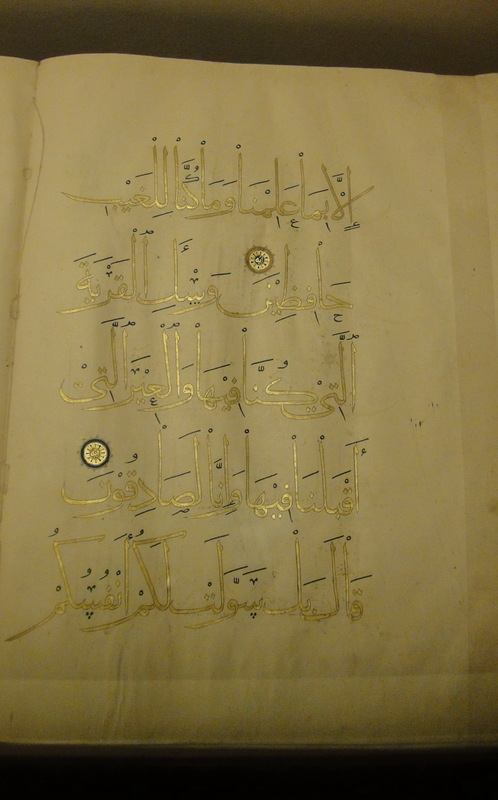 This sentence is already 22 lines long!” and “How wonderful this amazing symmetry!” Etc. 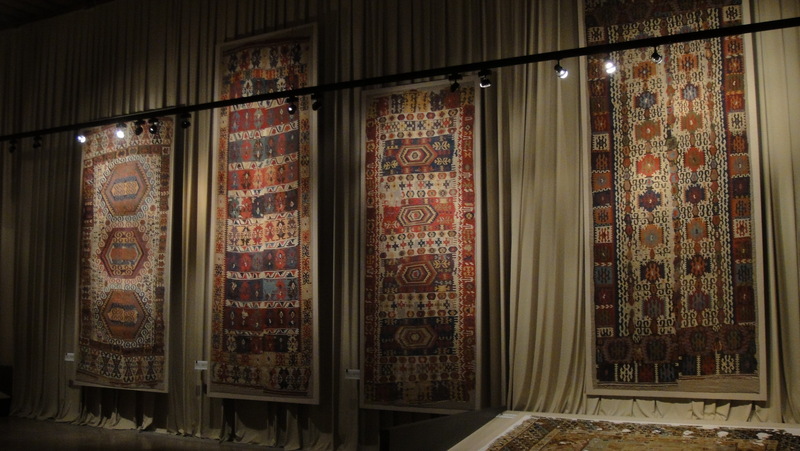 I have been looking at carpets for three years now; but most have been Iranian. 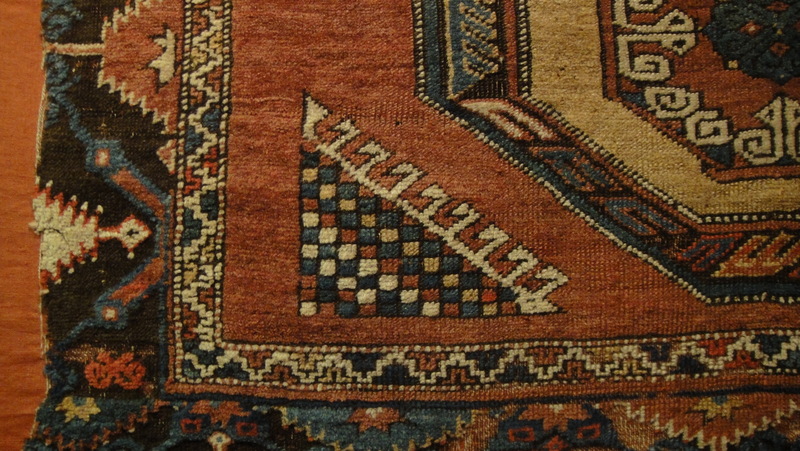 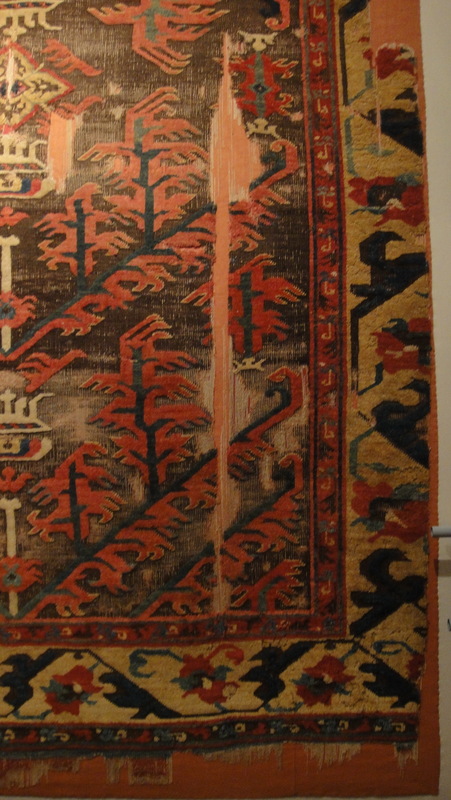 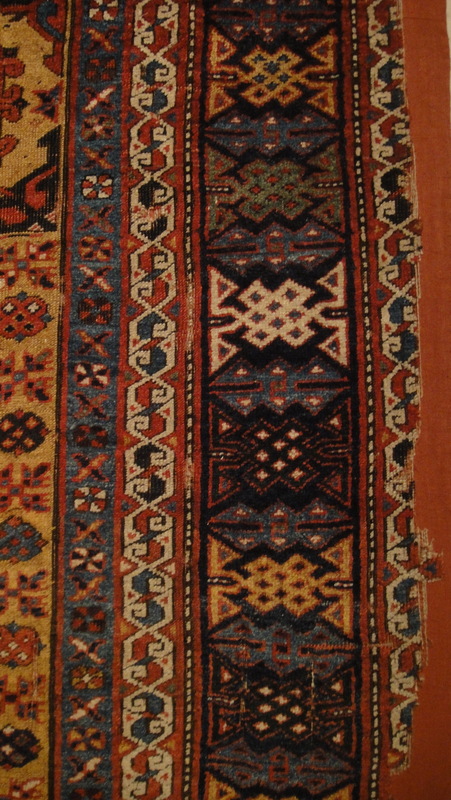 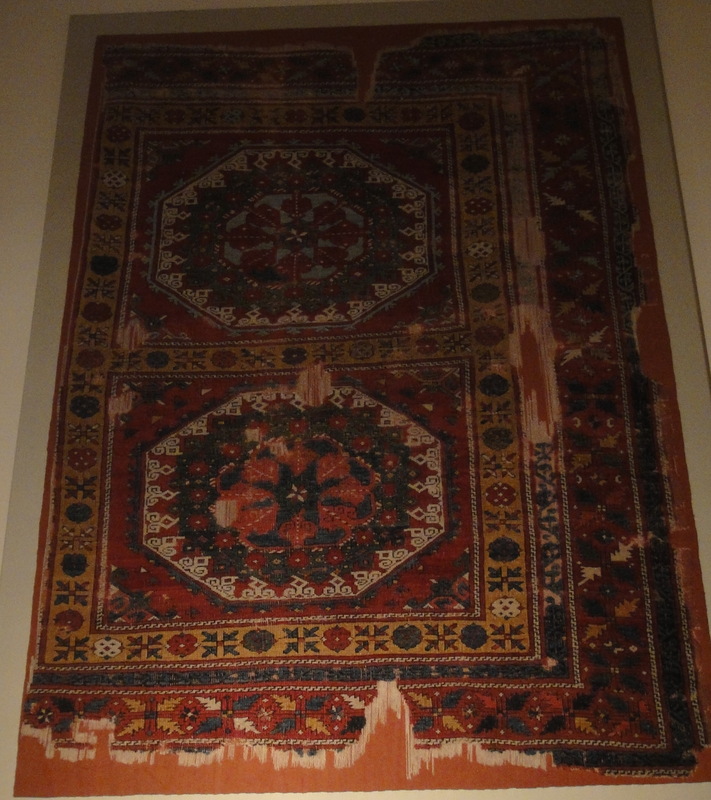 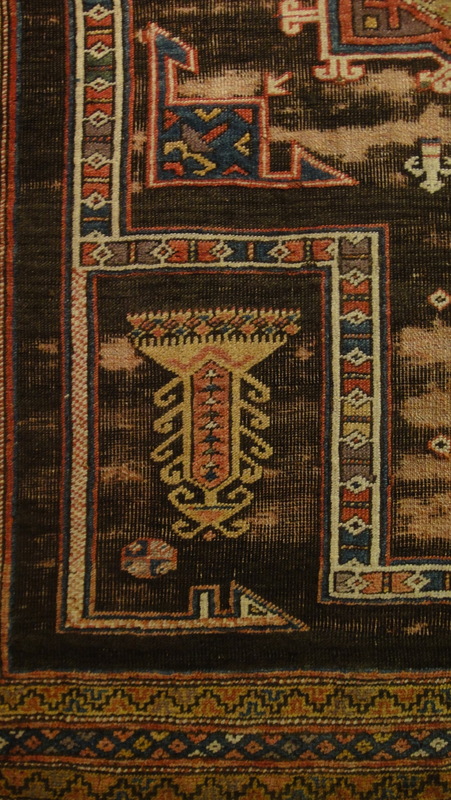 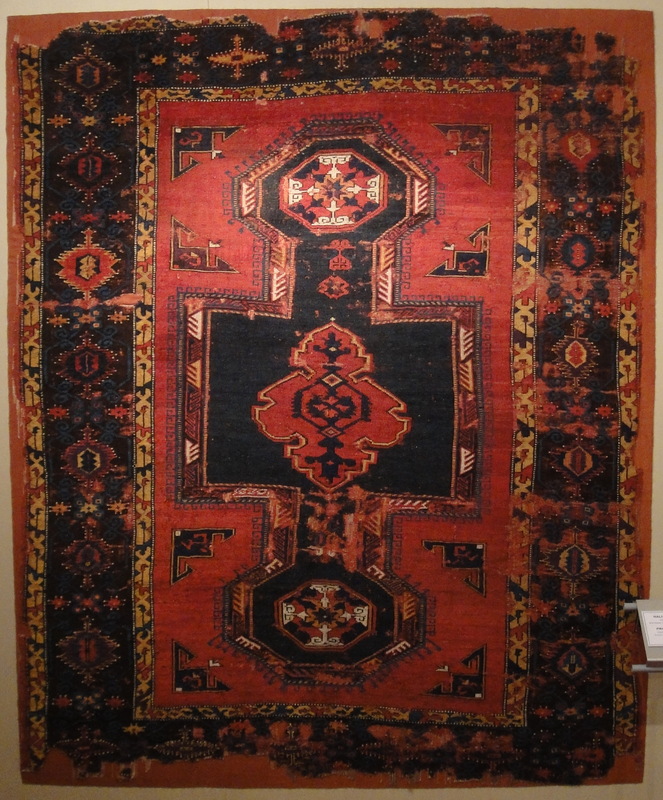 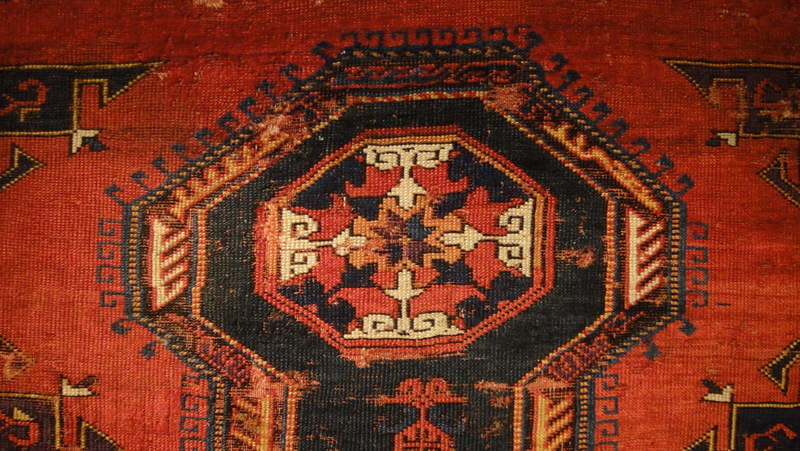 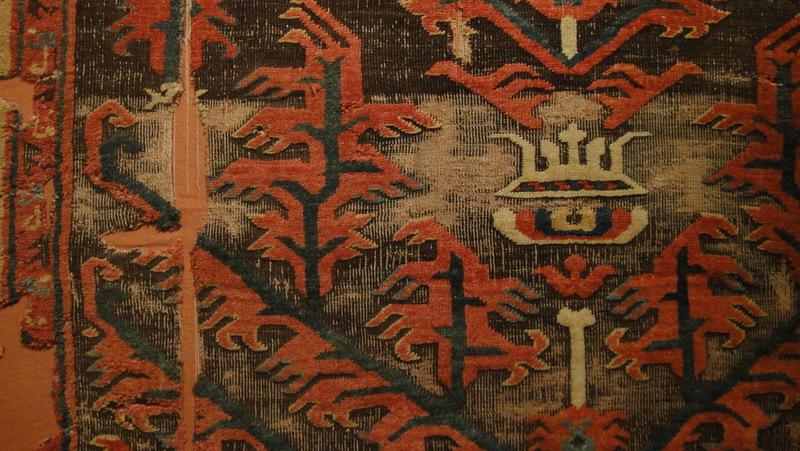 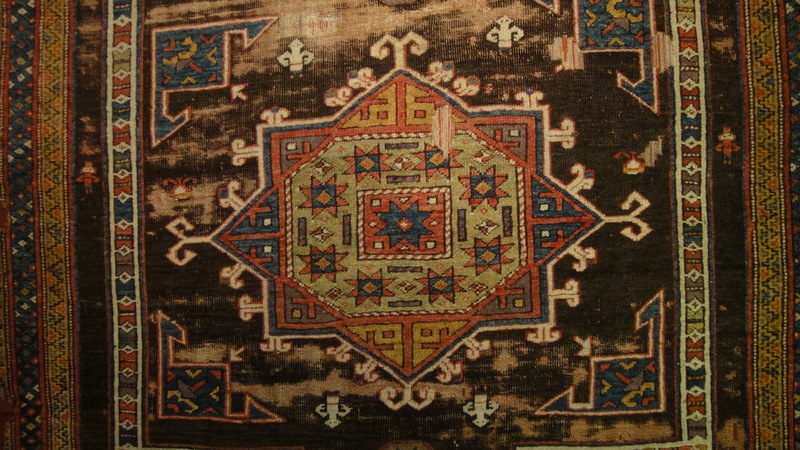 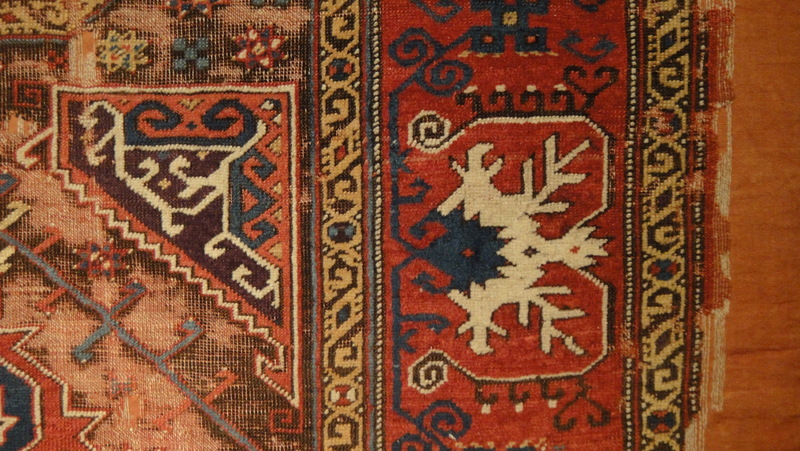 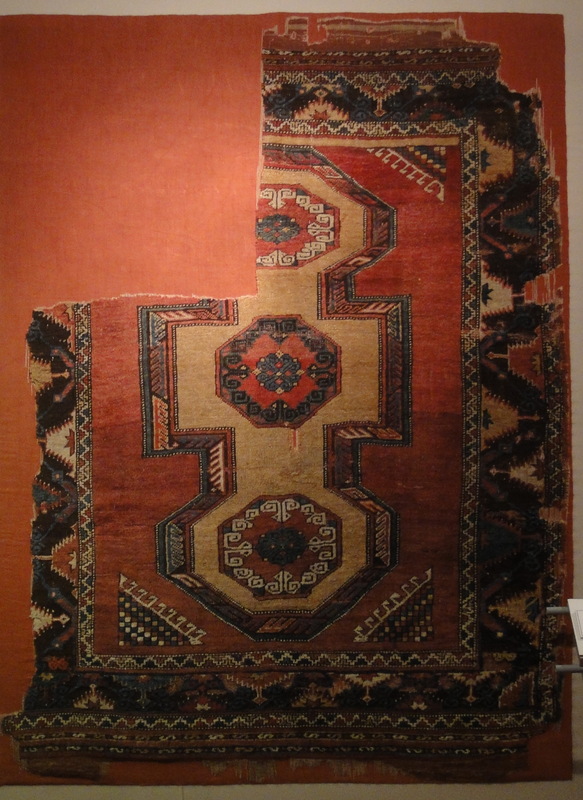 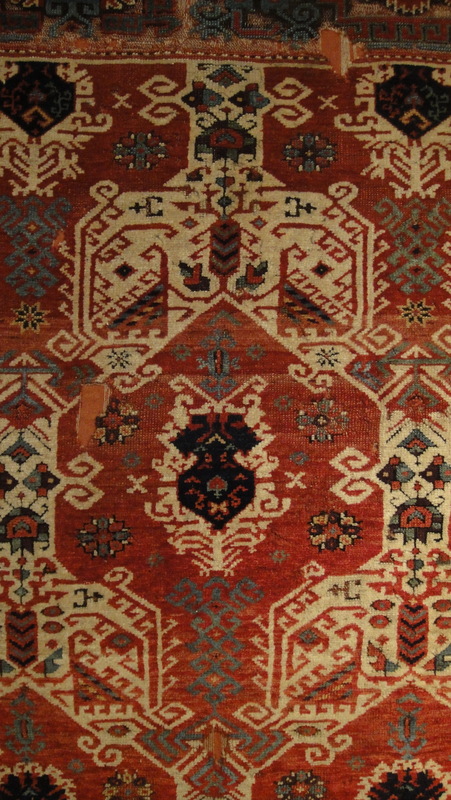 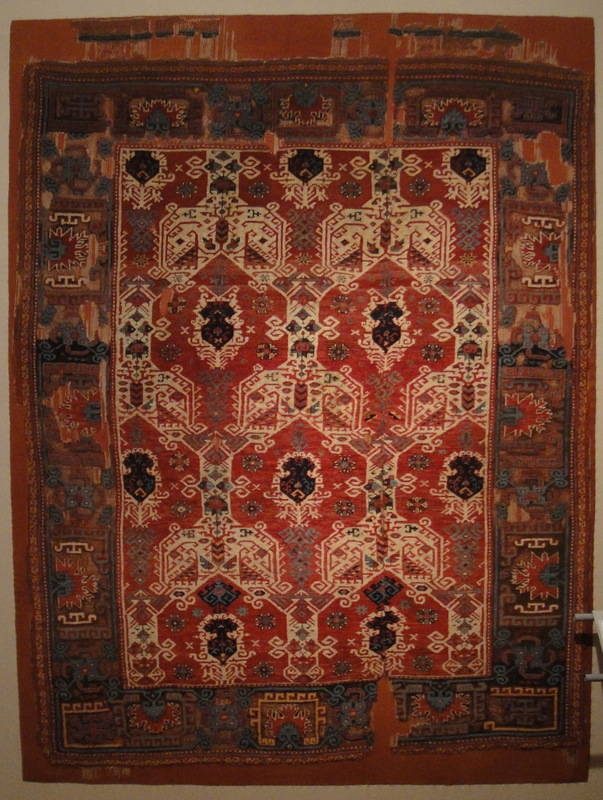 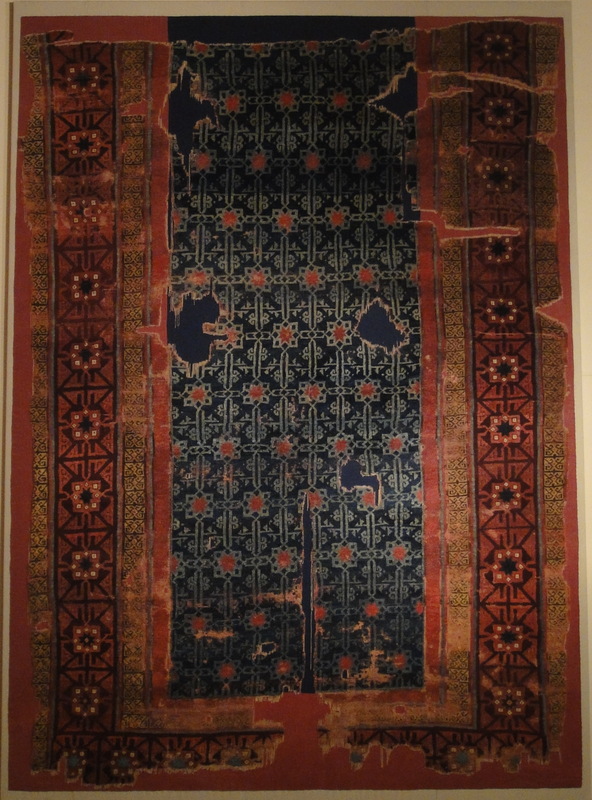 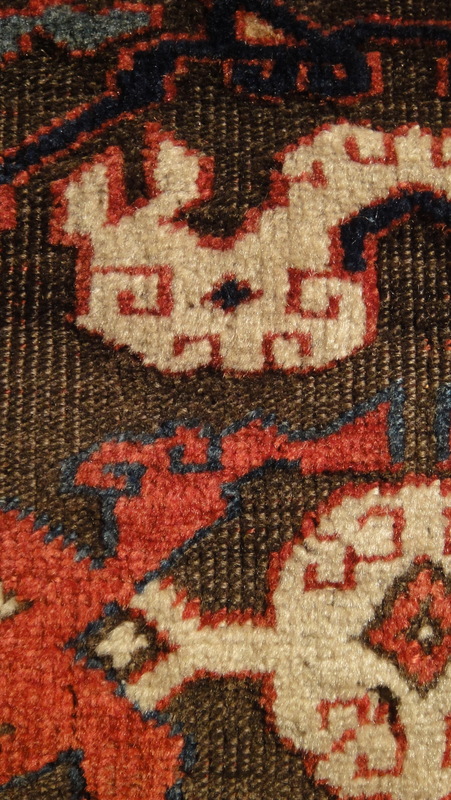 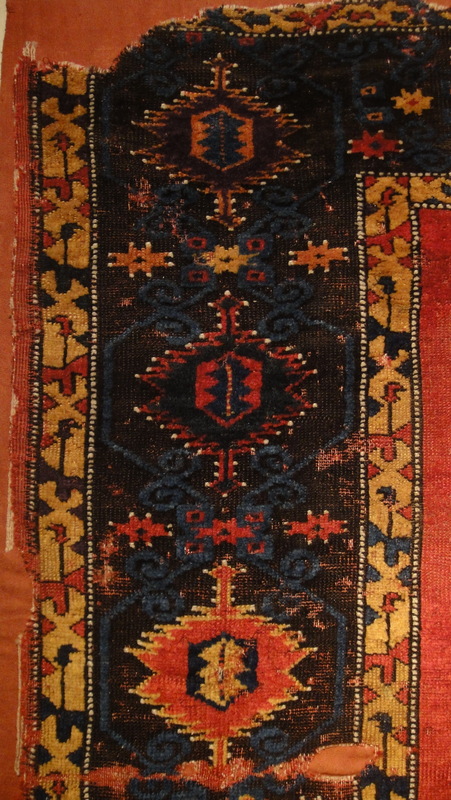 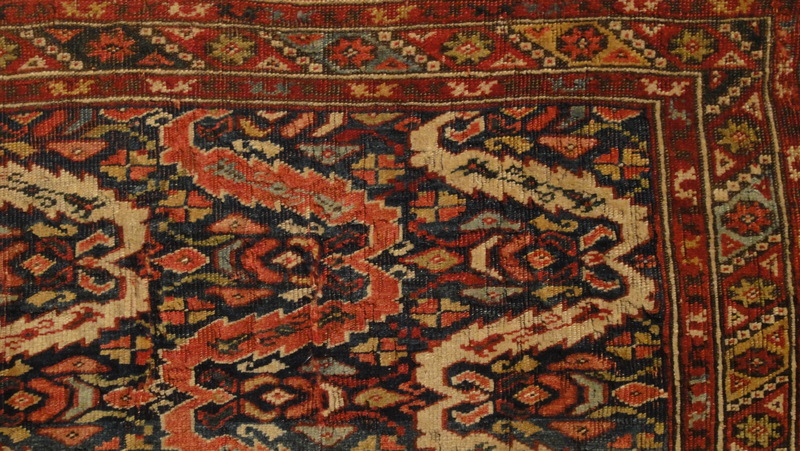 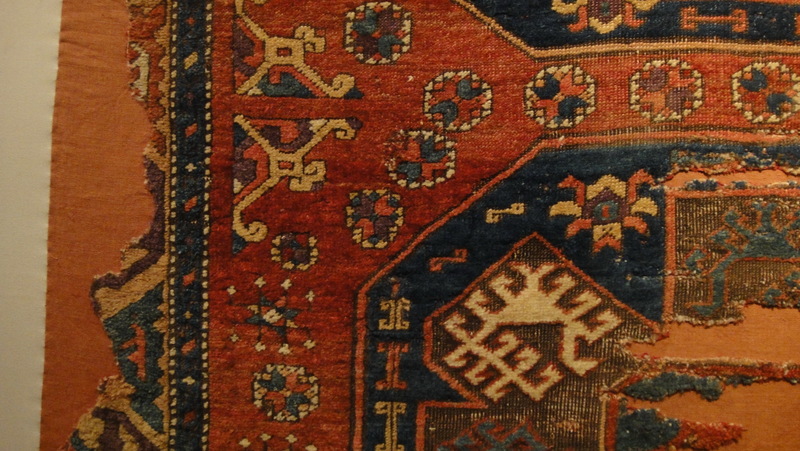 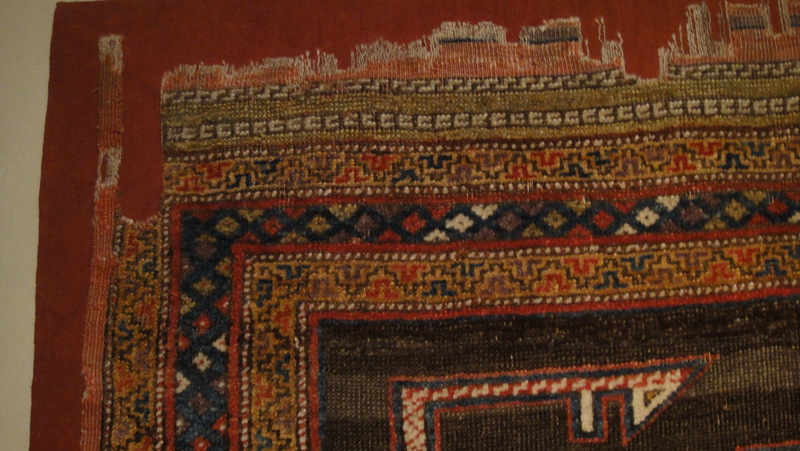 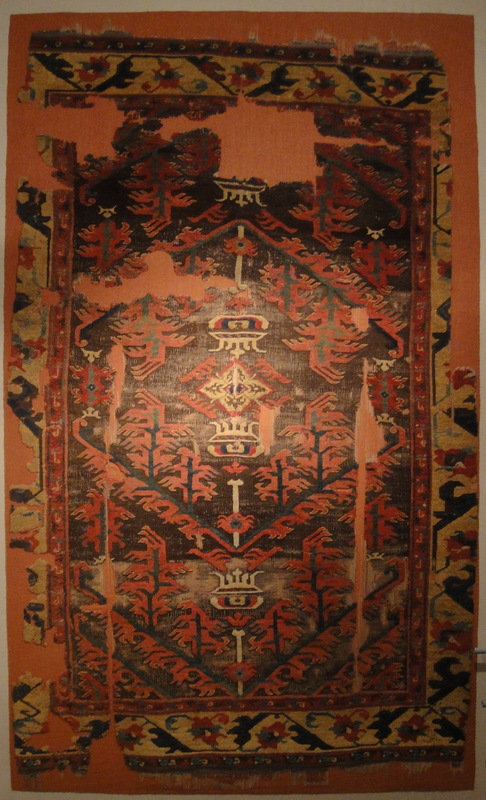 Nothing has prepared me for the utter weirdness — Mars-and-Aztec like — of the Anatolian carpet. 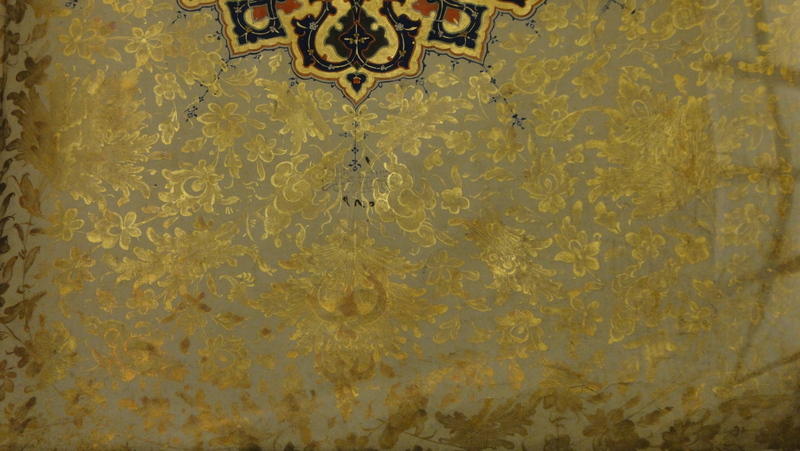 I had to get a chair and sit quietly for a quarter of an hour just to allow my mind to settle: like a puppy suddenly thrown among loud strangers, it had panicked and wanted to flee. 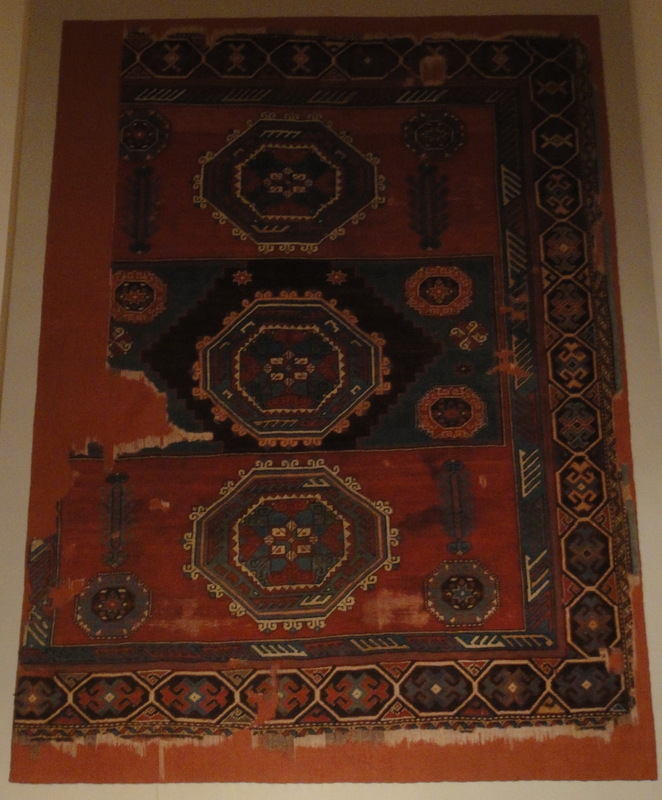 The museum’s artificial light fools my camera and there is a net loss of green, of which there is a lot here. 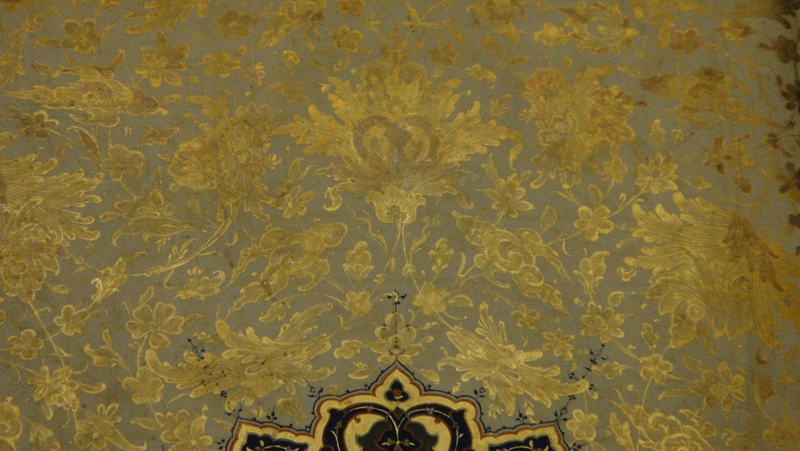 Use your imagination: the grey areas are dark, dull green. 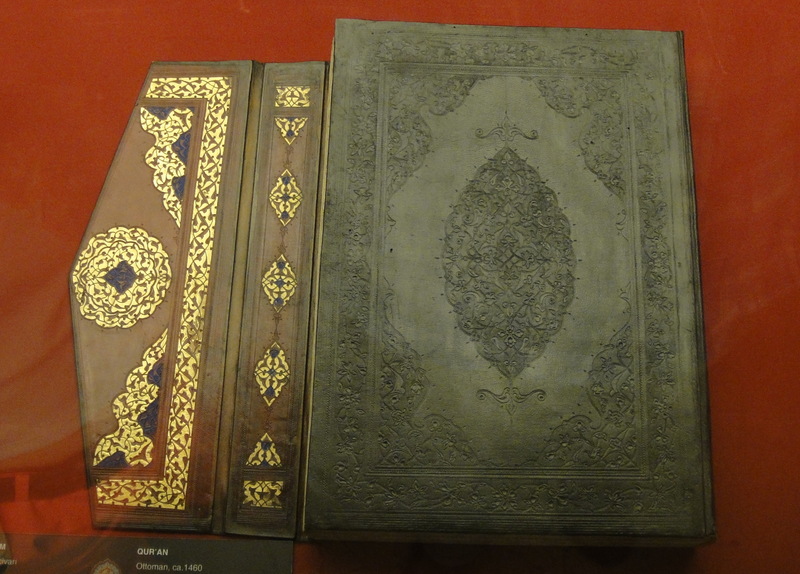 Nothing remotely as good, or as interesting, in the shops of Istanbul. 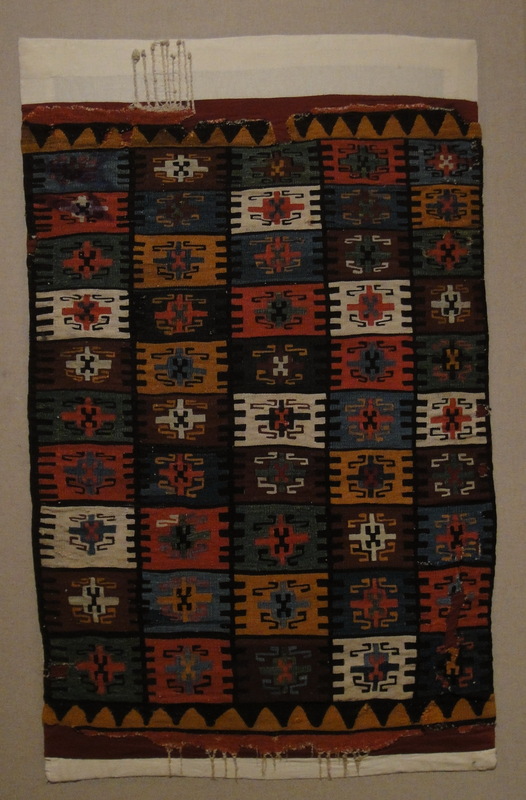 The colors, too, are different, more candy-like. 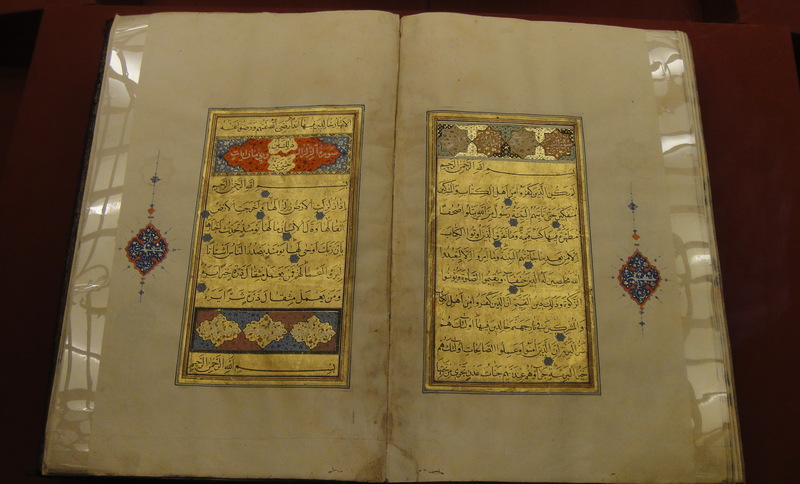 There are good soumaks (a.k.a. 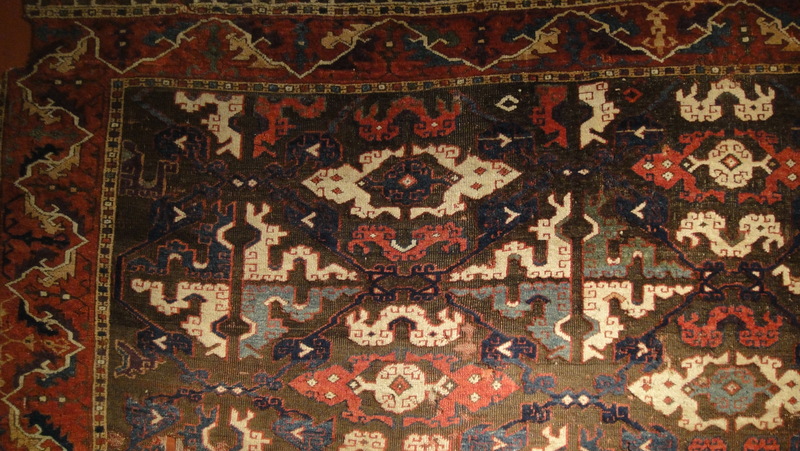 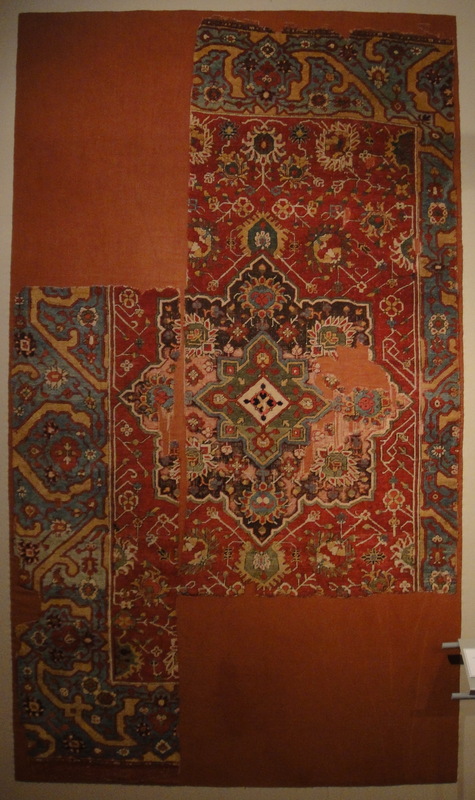 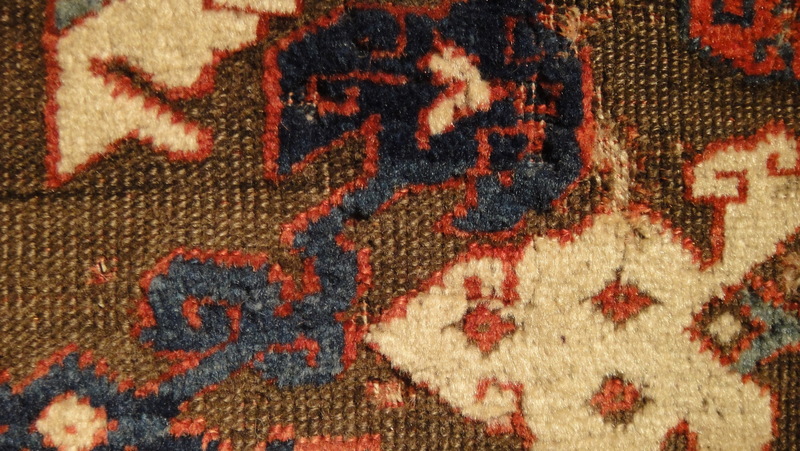 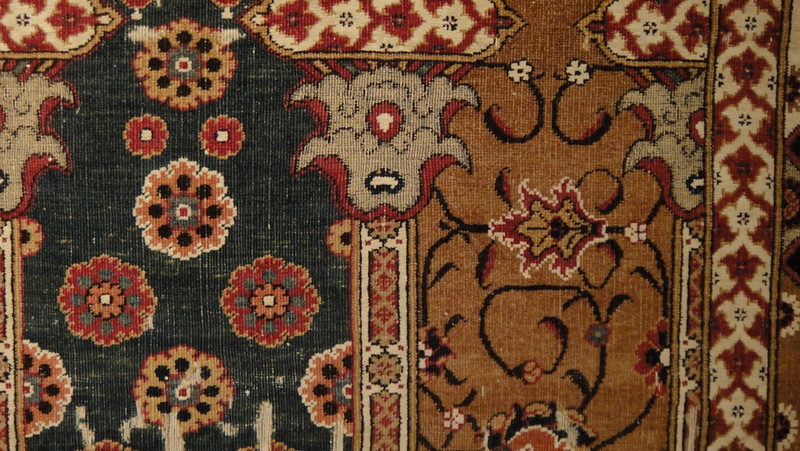 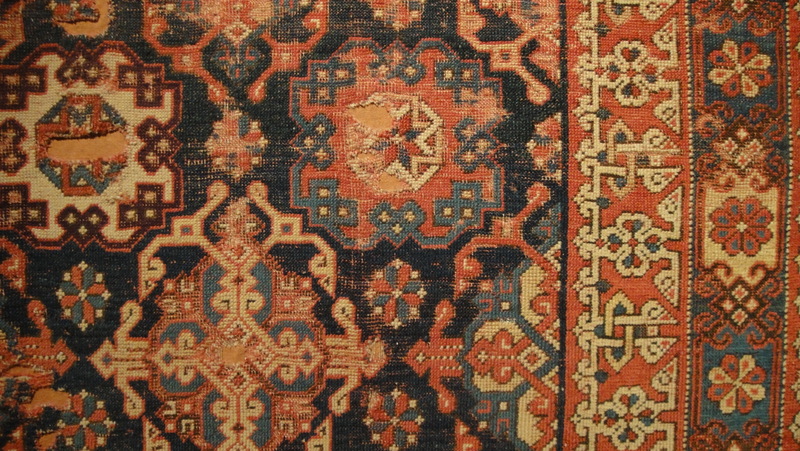 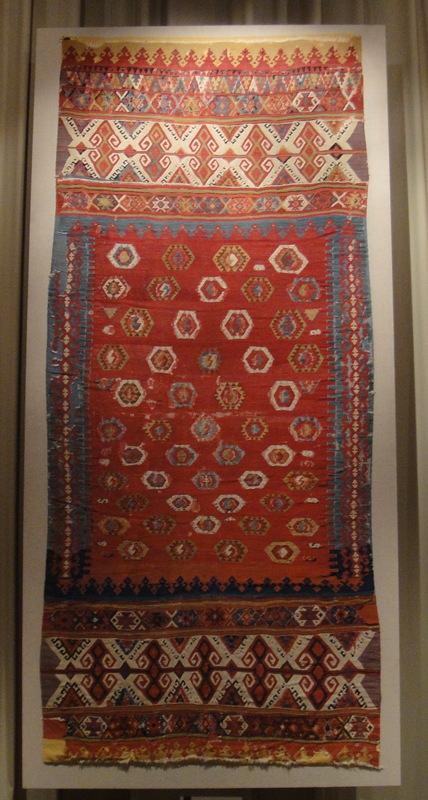 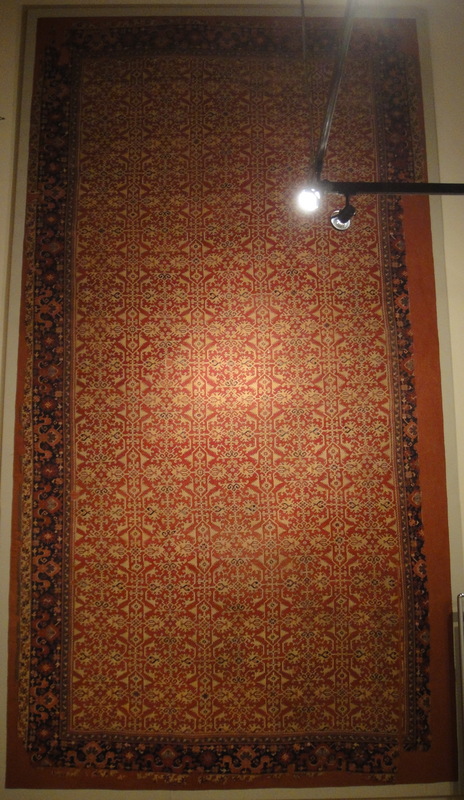 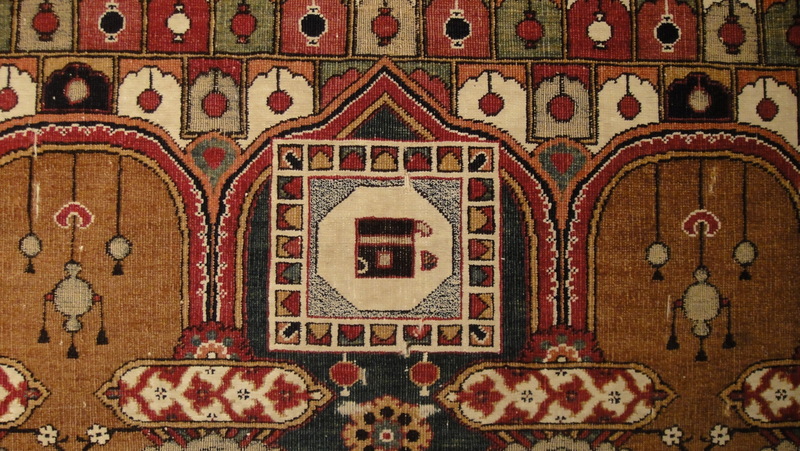 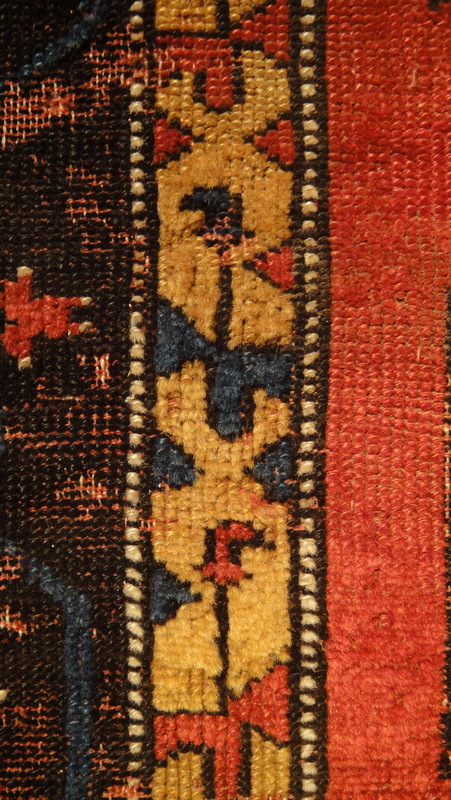 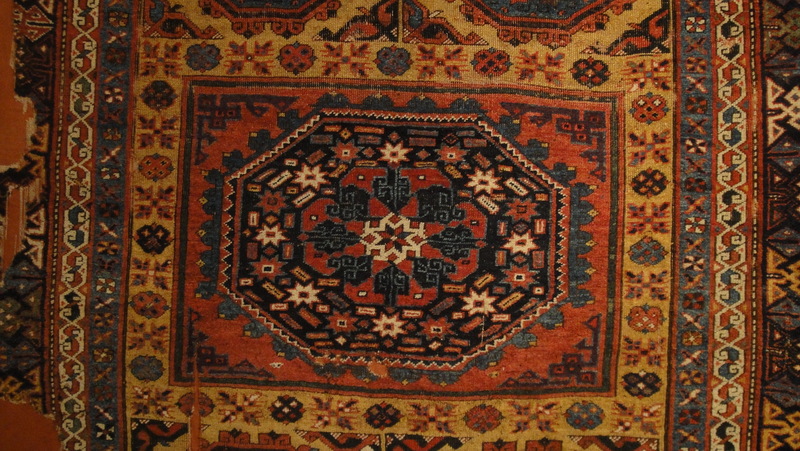 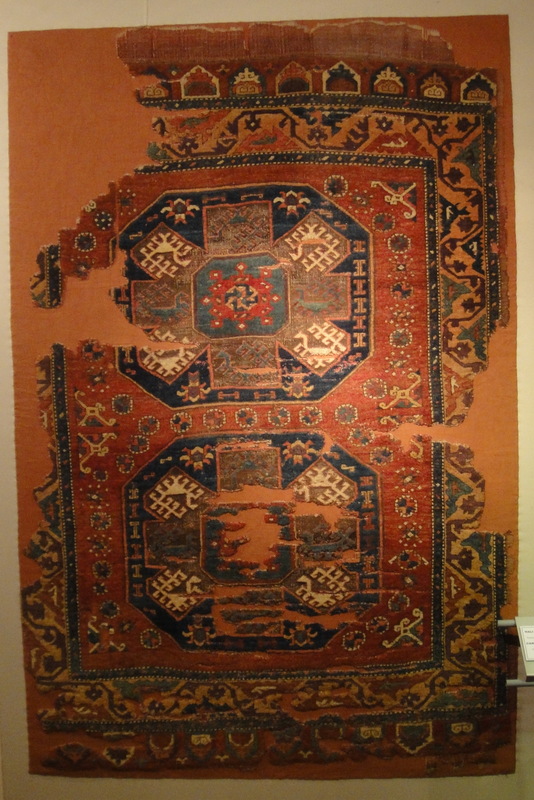 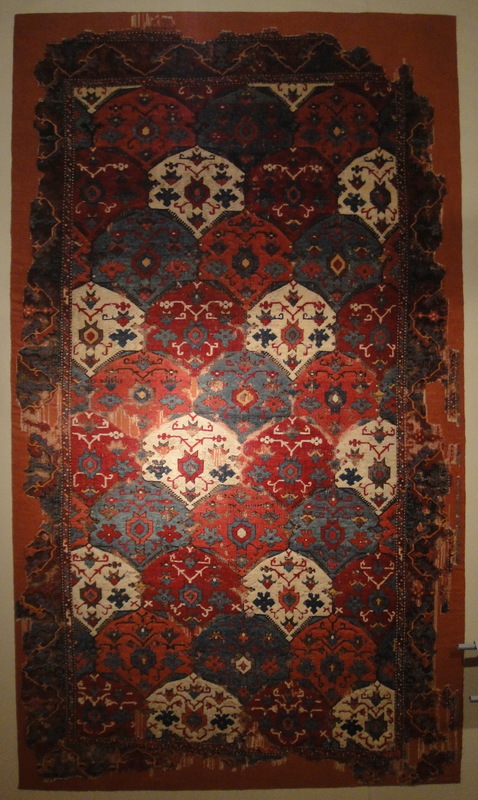 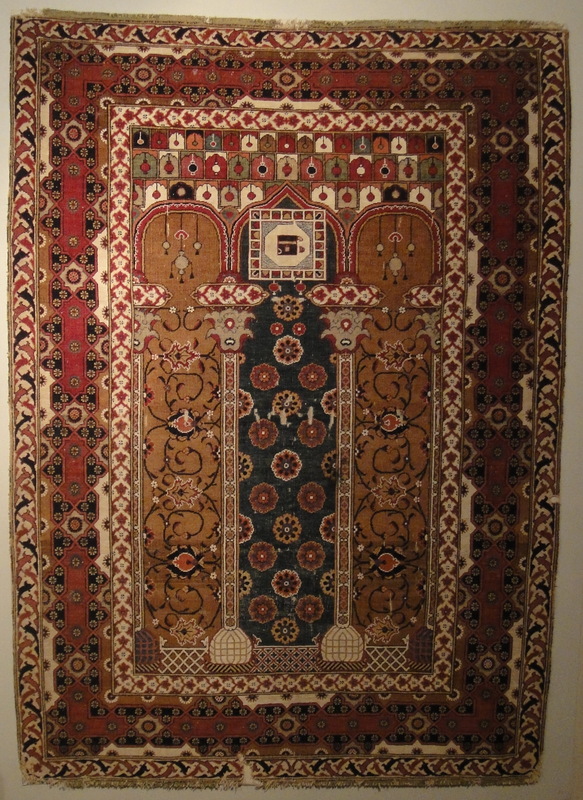 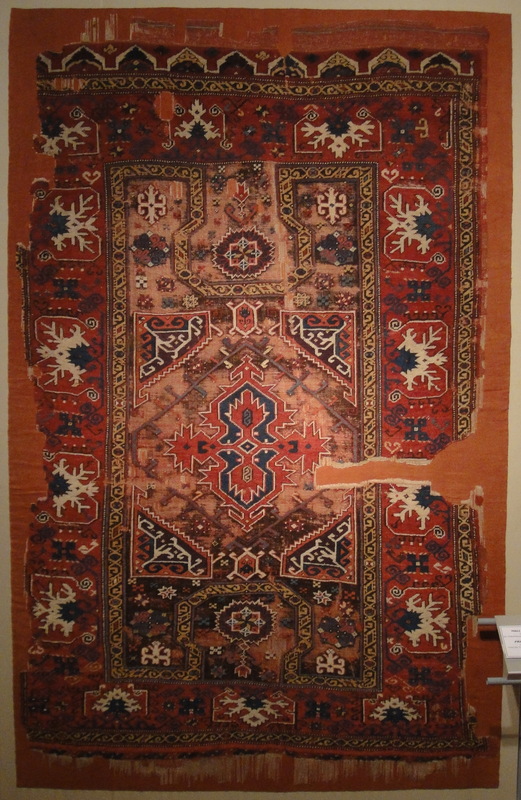 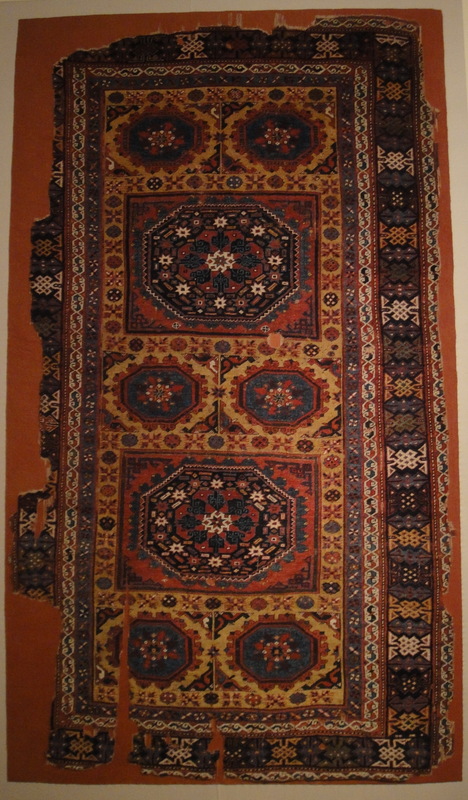 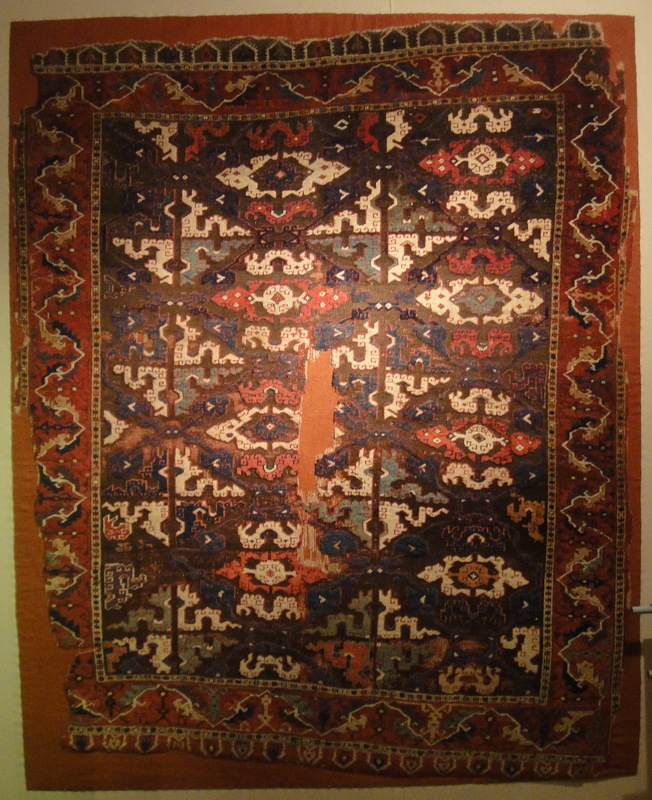 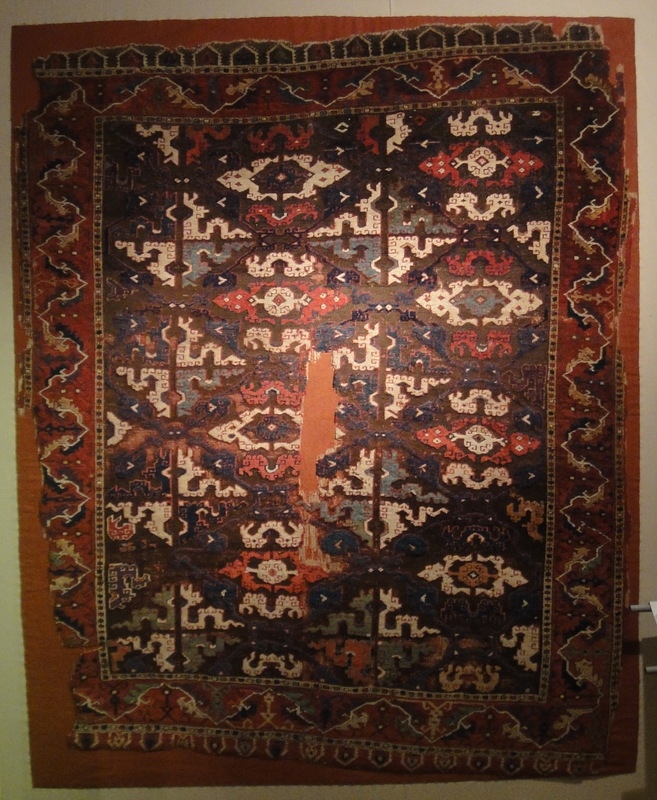 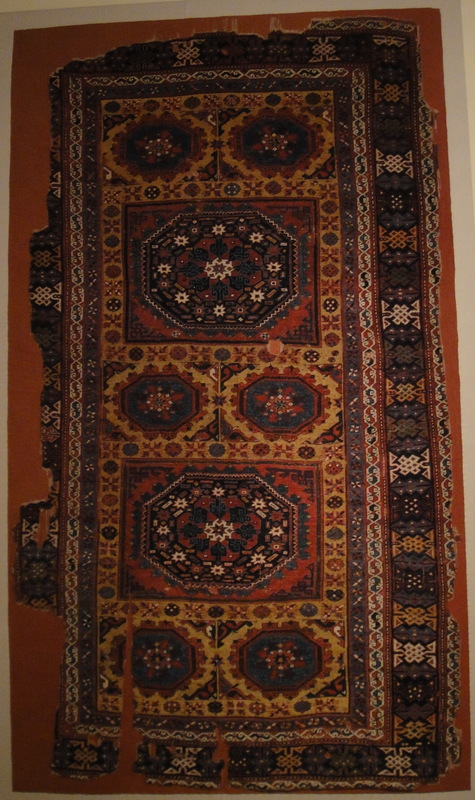 rahrahs) — a kind of flat-weave with an invisible structural weft and cicims (embroideries); and all are Iranian; which is great, but not much comfort if you want a carpet to sit on. 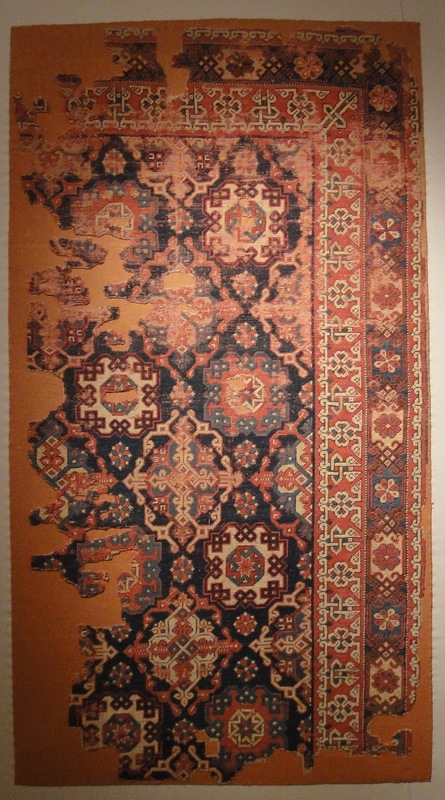 (I had determined not to bother with sofas for the living room: available furniture is ugly and the ridiculous price will buy me a decent rug. 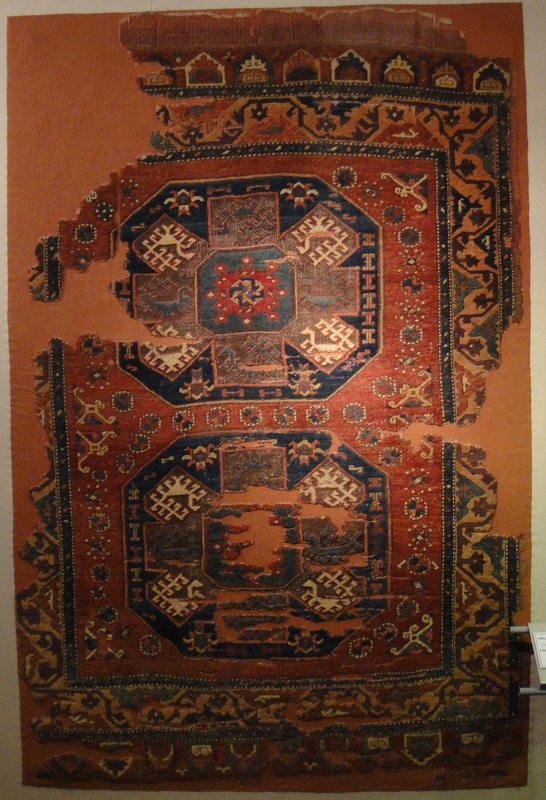 And I am used to, and prefer, sitting on the floor, anyway. 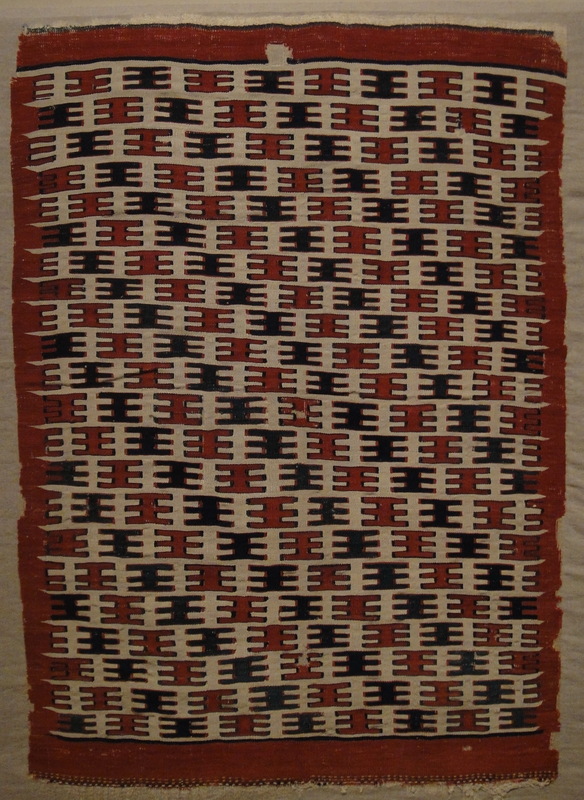 But for this, it has to be a rug, not an flat, bone-crushing flat-weave or embroidery). 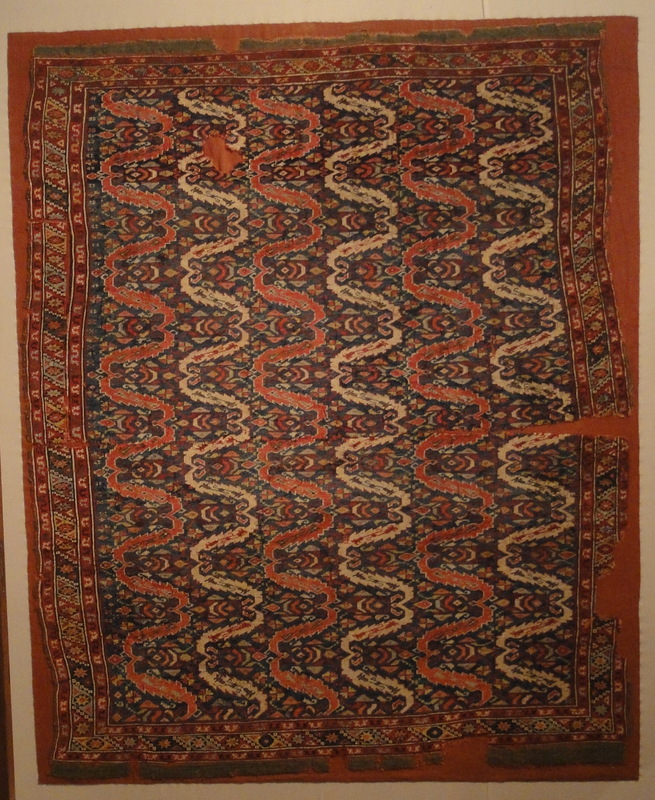 My favorite design here is the “DK” — an extraordinary fish-scale pattern (hover your mouse over the photos and their names will appear). 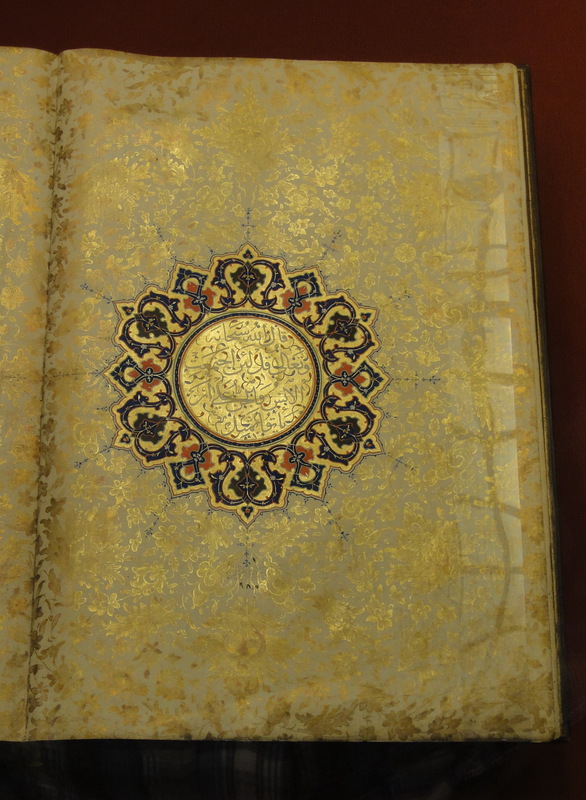 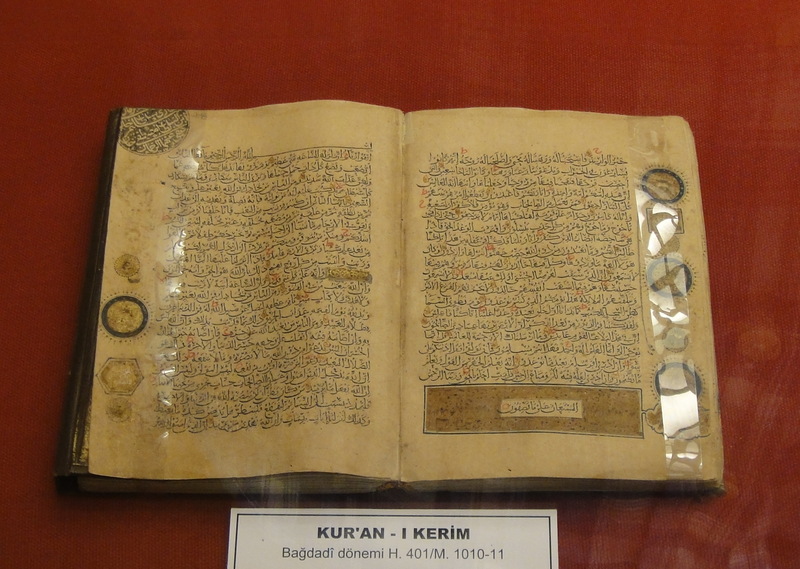 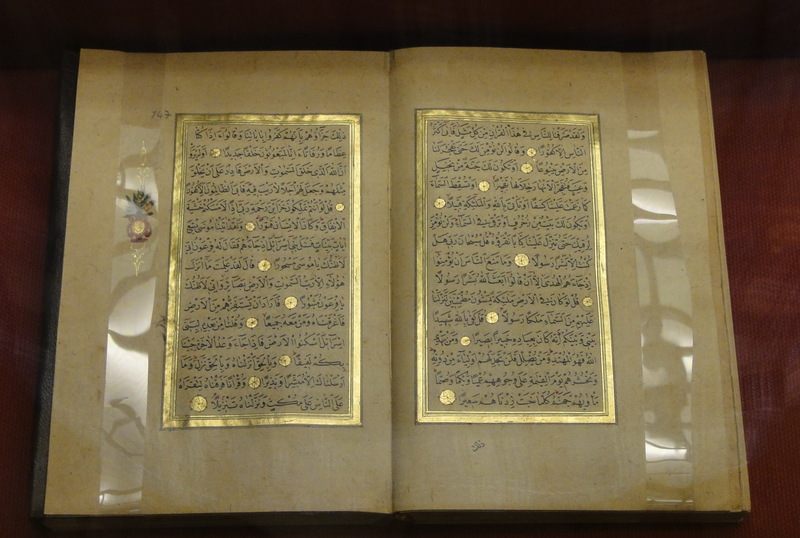 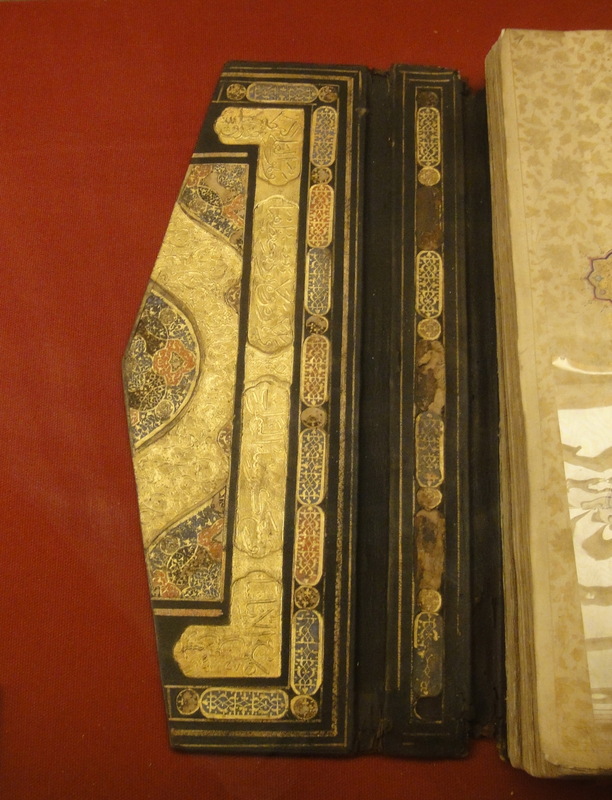 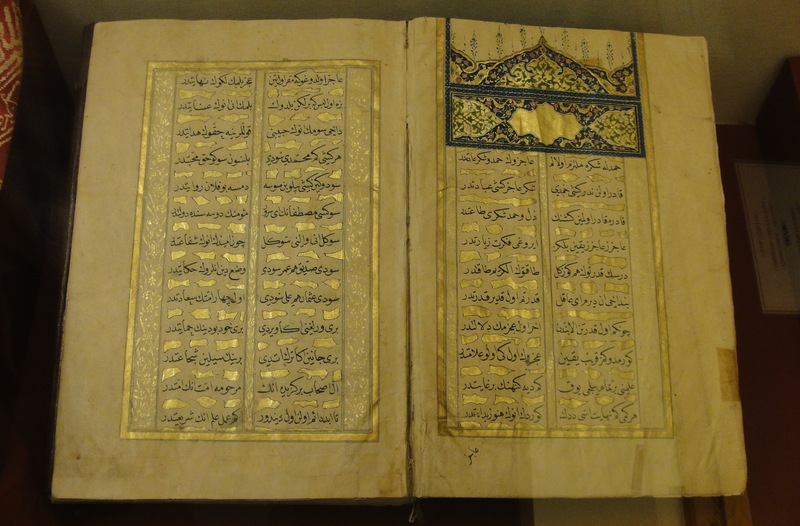 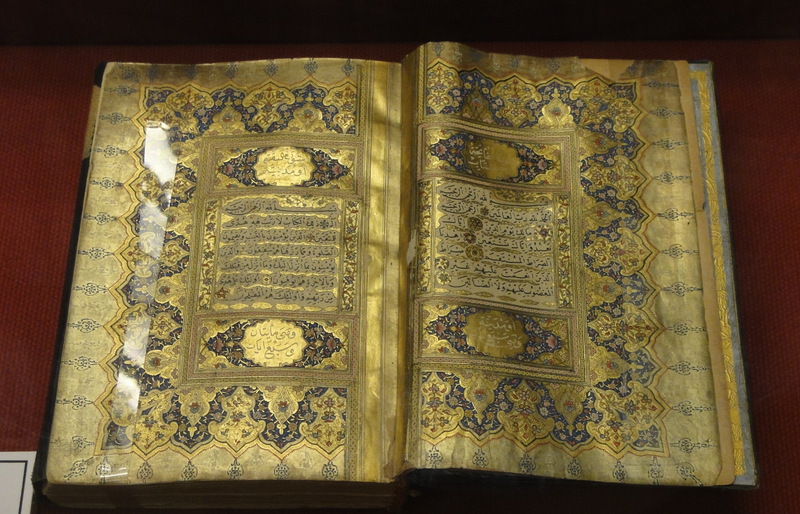 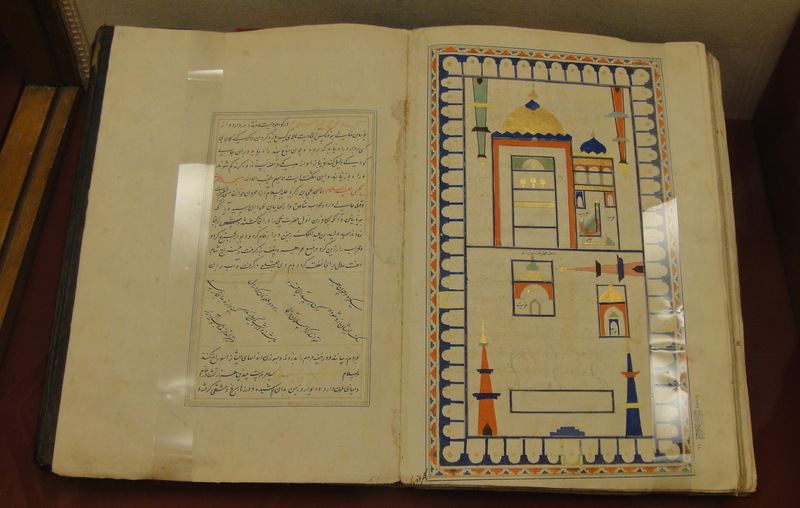 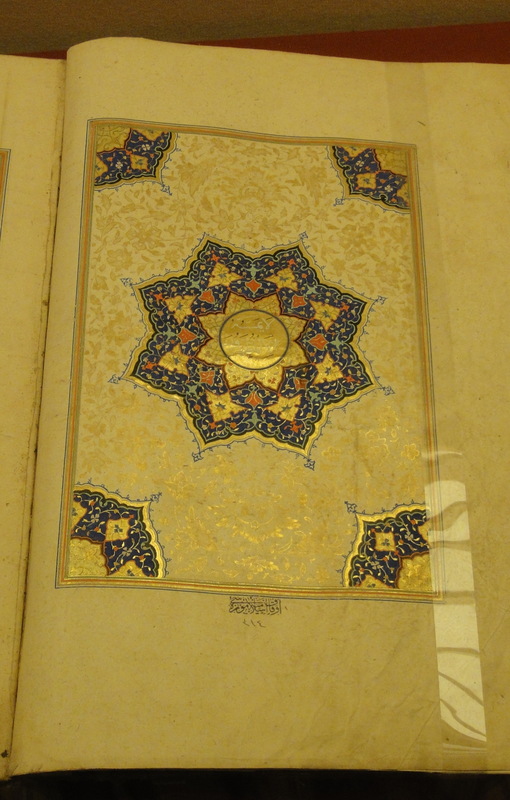 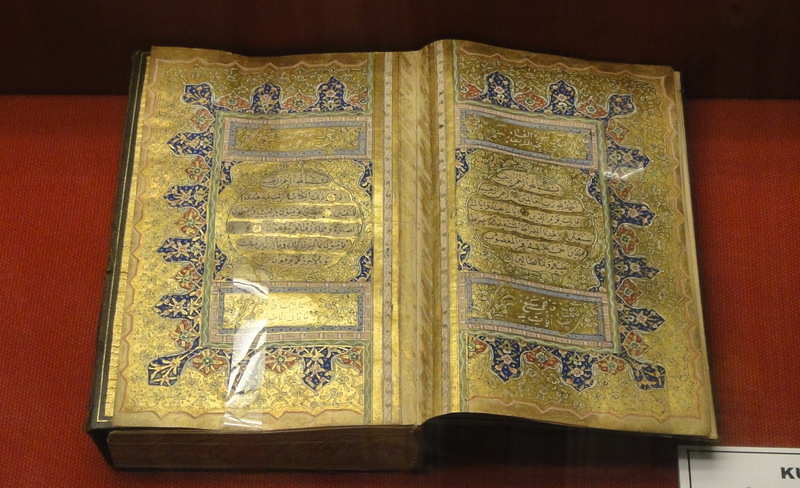 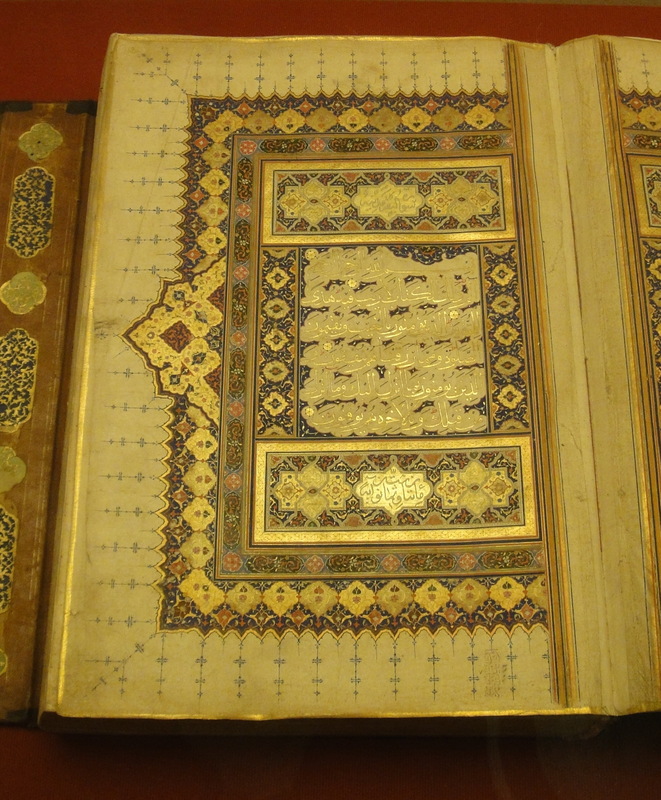 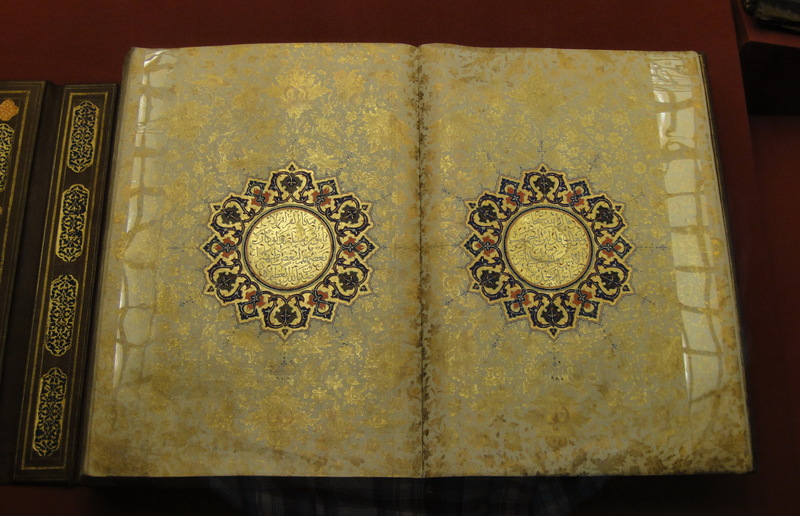 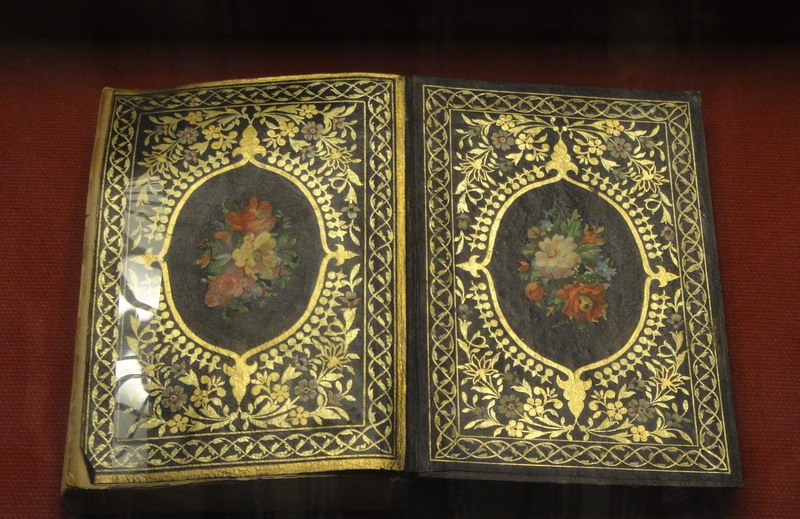 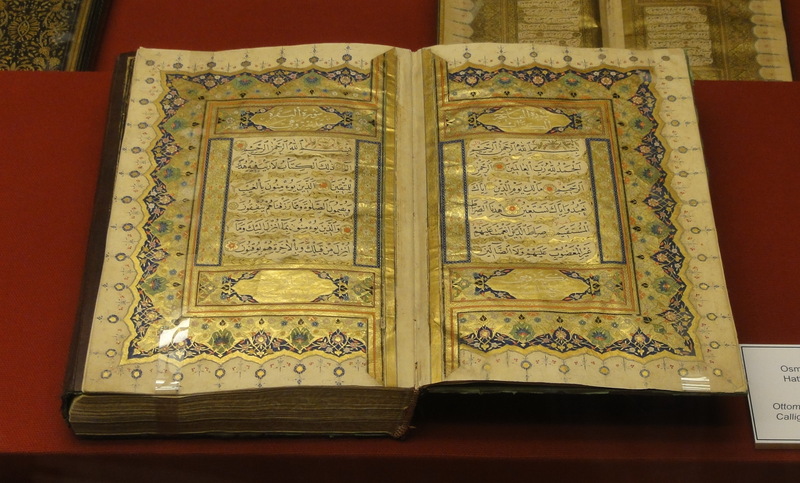 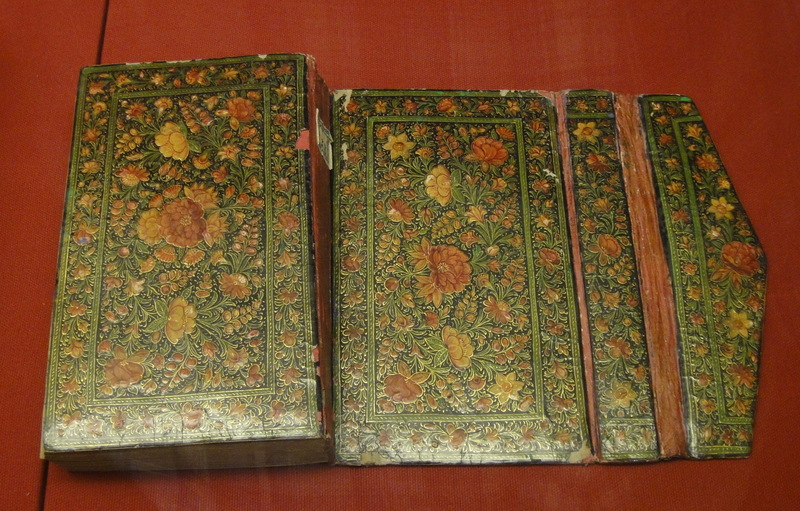 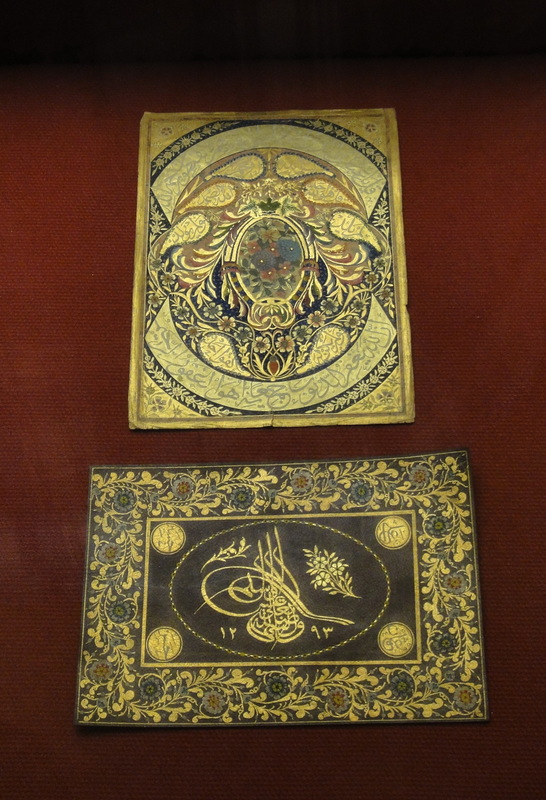 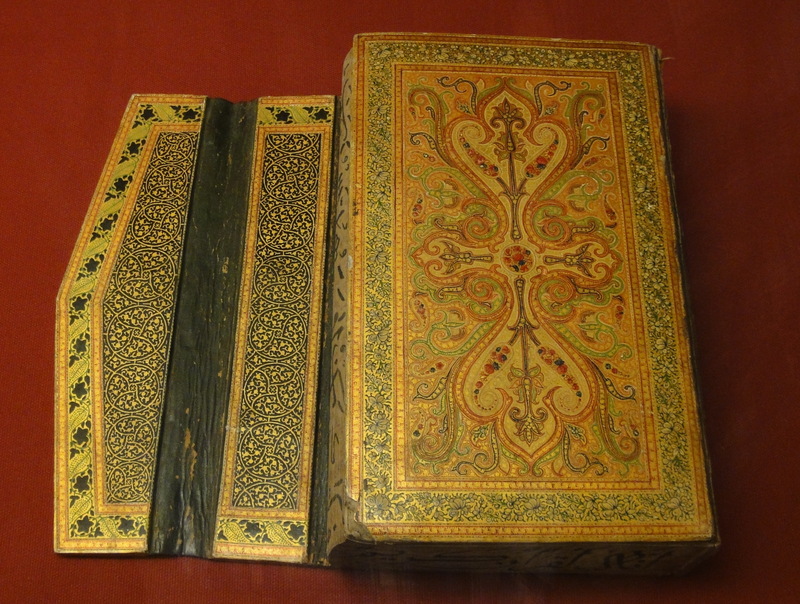 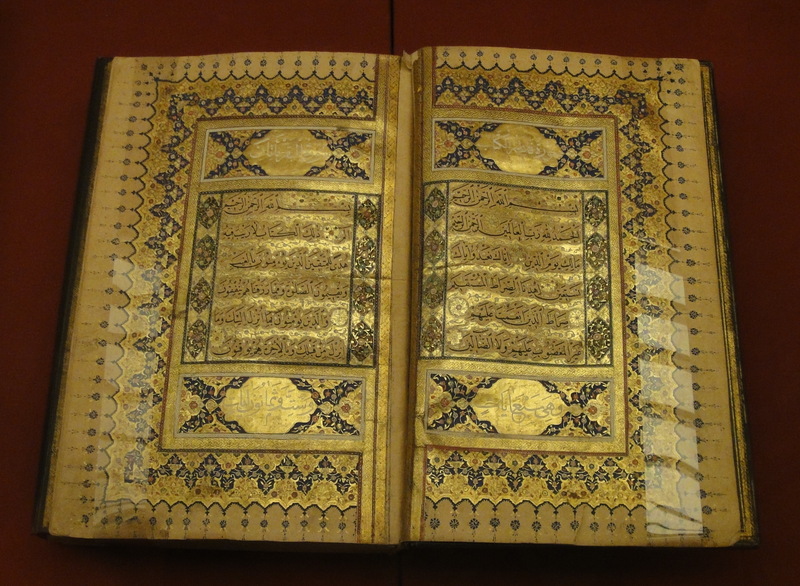 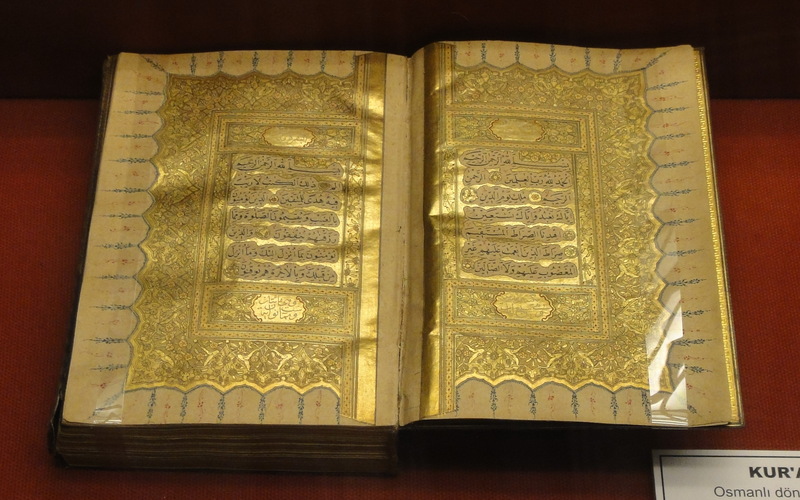 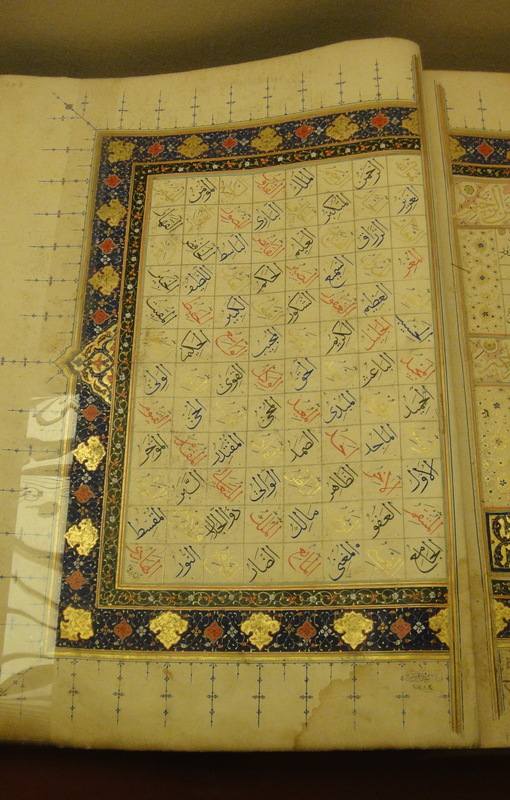 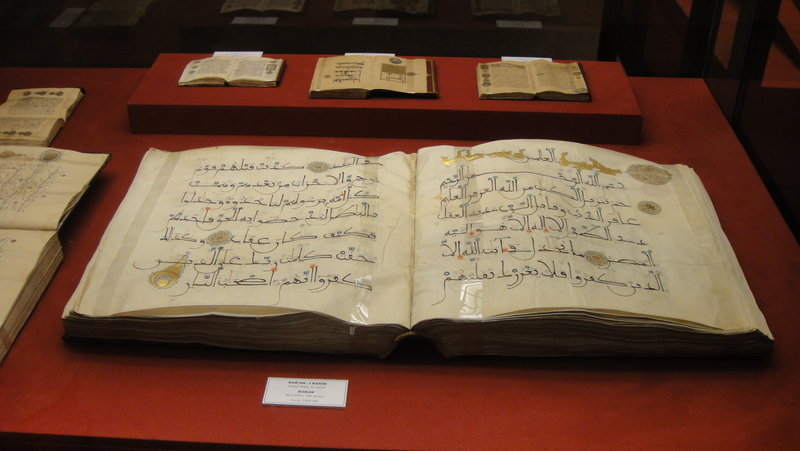 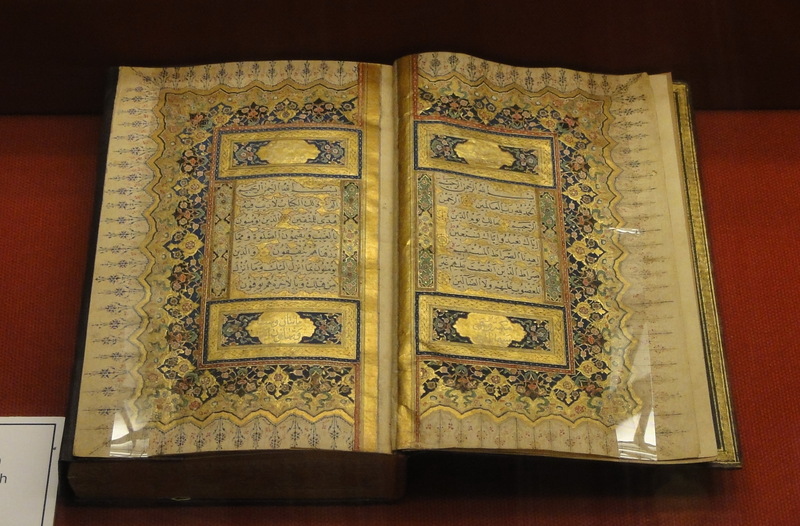 This is the complete photo archive of the book collection on display at the Turkish and Islamic Arts Museum, Istanbul. 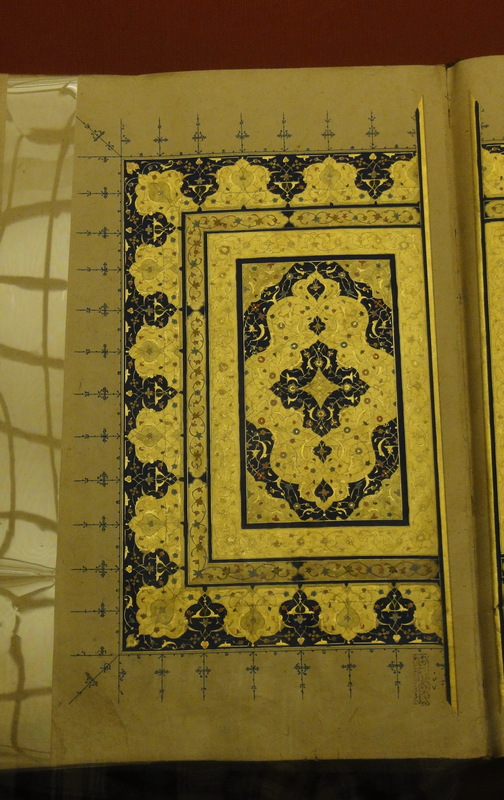 The files are very large (1.5 MB on average) and there are 89 of them, which is why I relegate them here; and only place a digest version on the front page of the blog.